Just like Tournament #1, each matchup consists of 2 fleets facing each other in 1v1 competition in a 3-game series. The fleet that wins the series advances to the next round. To save time, if a fleet wins the first 2 games of a series, the third game of the series will likely not be played. If you’d like to join the tournament, just let us know. The seeding is based primarily on each fleet’s winning percentage. Of the 16 fleets participating in T2, 6 were determined before T1 based on their past performance – these are the best of the best. 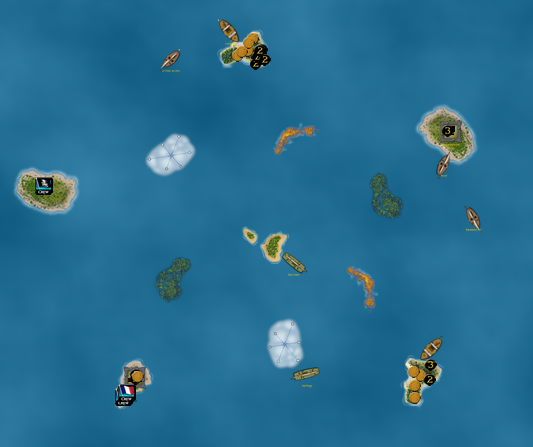 Then, the top 4 fleets from T1 were added. Finally, over the past few days Xerecs and I have selected 3 fleets each for the final 6 fleets of the tournament. The seeding wasn’t strictly based on winning percentage – exceptions were made based on our judgement and who was going to play each fleet in the first round. We based our bracket on this, with the exception that in each matchup, the higher seeded fleet is on top. The picture below shows the bracket, but to clarify, here are all of the matchups and fleets. This order simply goes down the left “division” or column, and then it goes down from the right. However, we may not play the games in this order. Also, some of these fleets may be edited slightly by the time we play them. If I had to bet money on the winner of the tournament, I would pick UPS 2. Xerecs said he would pick either HMS GT or UPS 5. Our “sleeper” picks were generally the Doldrums and “Quick wins the game” fleets. 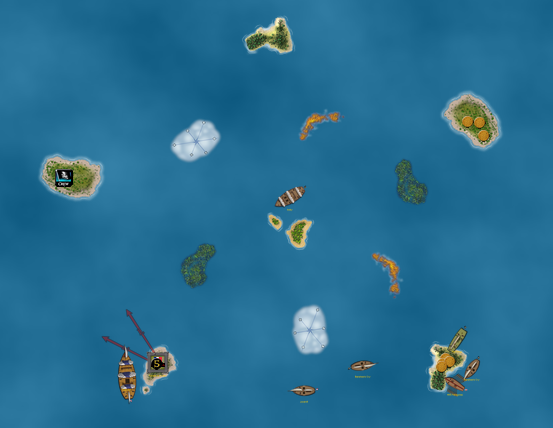 For the final game, the home islands were close together. The Neptuno didn’t have a lot of room on her first turn, and luckily I got an SAT to dismast her. From there the game was predictable, with the English firepower too much to overcome. Two more series have been played! We decided to go in seed order – the second matchup would feature the #2 seed, and so on. The Elthelfleda gets home before the Zeus can strike, but things aren’t looking good for the English. 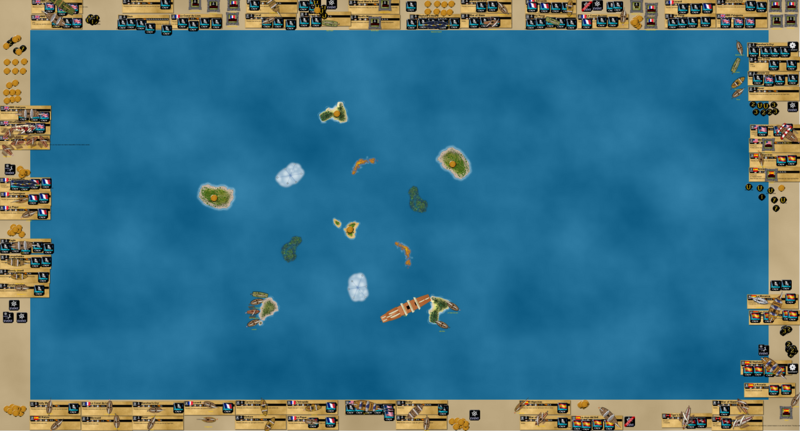 The second game featured different home islands. I made the mistake of putting the canoes near the Zeus again, but it didn’t seem to matter much. It’s important to note that the “Quick” fleet had the Coeur swapped out for Hidden Cove. The Coeur’s explorer was moved to the Courageux, while Cissey was moved to the Vengeance. I knew I needed to force the action with the Vengeance, or else the Pirates would get a huge lead with all of their gold bonuses. The Coral would be the primary target in all games of the series, and here the Vengeance dismasted her with a well-placed L-range shot! 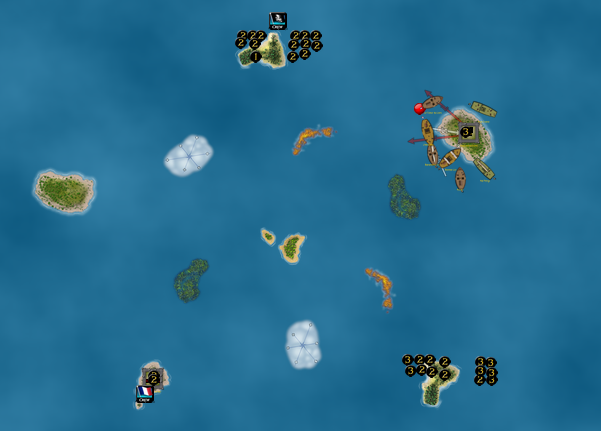 At the French home island, the Pique is about to be given an explore action to give her gold to the Courageux, who will redock to get Aristide’s bonus on both hauls. For the second game the HI’s would once again be at opposite ends of the playing area. Then things started getting interesting. The Pirates built Dead Man’s Point on the island, but the Vengeance rammed off the Coral’s single mast. The Vengeance couldn’t overcome the combined firepower of the fort and LS. The French cleaned out their two islands, but the Sea Crane established the Devil’s Maw on the center island. This effectively ended the game, and it was time to count! The French had 16 gold to the Pirates’ 9. Quick wins the game advances to the second round! The Neptune’s Hoard (NH) found Rum on the middle island, freezing the ship for a turn. In hindsight, I could have used the ship’s ability to trade away the UT, but in addition, Rum probably shouldn’t be in the fleet in the first place. The San Cristobal (SC) caught the NH and blasted most of her masts off. Luckily for the Pirates, the final mast standing meant the NH could return home with a sac action. The Star of Siam docked home gold on the turn as well, giving Norvegia a bit of a windfall. The Banshee’s Cry (BC) is hiding from the SC while the Monarca runs gold. The Monarca reached home with Buried Treasure (another UT I’m taking out of the Norvegia build for future games) and Spices, while the NH was able to damage the SC with a double action, including a ram of her own. The BC grabbed some coins but wasn’t able to get them back home. Total destruction! The San Cristobal gets an EA, which lets her dismast the NH and BC. The Star of Siam was in the fog, and came out to score a hit. However, the game was as good as over when the NH’s final mast fell. Once again the SC got an EA, but she couldn’t reach the Neptune’s Hoard! The Star of Siam was sunk instead, allowing the NH to reach home with gold. With the NH docked, the SC then went after the Banshee’s Cry. The BC was sunk, but this opened the door for the Pirates to strike. I nearly went for the northernmost wild island, but I then remembered that from past experience, sinking the only gold runner an opponent has gives you a very good shot at winning the game. The NH used a sac action to reach the Monarca and dismasted her! Norvegia won the game 8-1. Norvegia advances to the second round! This was a fun series, and the Spanish Meta fleet is definitely a tough customer. The biggest differences were the guaranteed sac actions of the Norvegia fleet against the EA roll for the SC, which sometimes doesn’t work, as well as having 3 gold runners compared to 1. I really love my EA gold runners fleet, but I love UPS 2 as well. Also, as I said previously, if I had to pick a fleet to win the tournament, it would be UPS 2, although it’s very close and there is very tough competition. I was disappointed to see that these fleets have already faced each other, with UPS 2 prevailing 2 games to 1, but that was bound to happen in this tournament anyway, and will likely happen again. 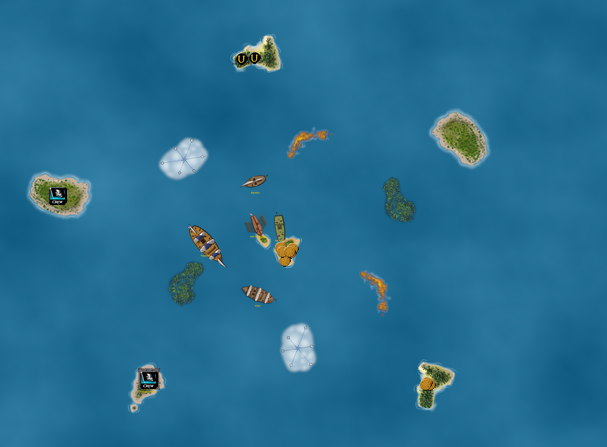 The EA fleet got off to a great start, with the Joya and Star of Siam (SoS) receiving EA’s on the first turn. 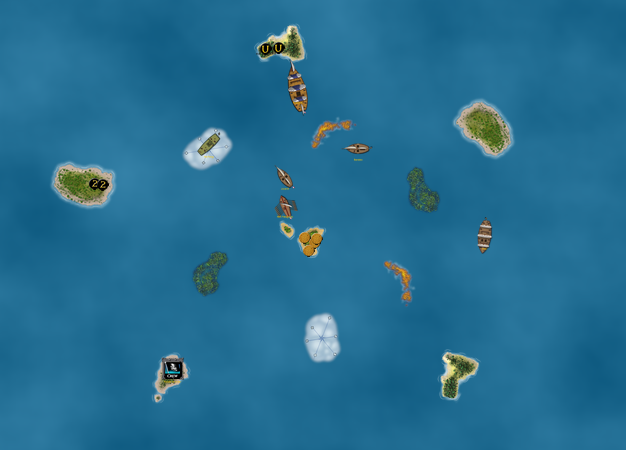 The Joya grabbed gold from the center island, while the SoS headed west. The SoS eliminated some turtles, while the Joya made for the northeastern island. The Hai Peng wasn’t quite fast enough to beat the Joya to the island from across the sea, so instead took a shot against the Algeciras (which missed) and then returned to Dead Man’s Point to transfer another coin home. The Joya used Homing Beacon to get home extremely quickly, and with most of the gold unloaded and the rest in forts, the game was called. UPS 2 had won handily, 27-13. This was the first time using UPS 2 in a while, and it didn’t disappoint! UPS 2 went first in the second game of the series, building a fort on the second island but finding useless UT’s and low gold values. Only then did UPS 2 play Hidden Cove, and CJS transported some coins home and Dead Man’s Point was erected on the island. The Hai Peng finally managed to dismast the Algeciras and escape a bad situation, scooting off to the southwest island to trade home some coins. My thinking here was that, knowing the gold values on the wild island, I could create a bigger gold advantage by tossing them home than eliminating turtles. It’s not likely the Hai Peng could get all of the turtles, but each coin transferred via CJS would get +2’d by Maurice Aristide. In addition, eliminating the turtles could have meant facing more shots from the SoS. UPS 2 was content to transfer home coins and get the bonus on each one, while the EA runners got busy attacking Dead Man’s Point. The fort took a hit from the SoS, while the Joya waited for an EA to get in range since she had no captain. The fort’s gunners didn’t expect any contest with UPS 2 going, and they were asleep at their posts and forgot to fire. The Star of Siam’s guns woke them up, and they connected to dismast the SoS! This took Gallows out of the action, and the EA runners were essentially down to one ship. The turtles reached home safely after the Hai Peng eliminated one of them, while the Intrepide and Coeur sailed north now that the HP didn’t have any gold to transfer. Xerecs and I were able to continue the tournament! We played three games; the third one was possibly the longest (by number of turns) 40 point game I’ve been involved in. It was incredibly desperate and wacky – keep reading to see what happened! Becalmed would soon prove to be a massive nuisance to the AP’s, giving the Doldrums fleet a head start. The Eagle waited for the Roanoke in the fog, while the Banshee’s Cry and Amity both docked at the same island. The Longshanks is already headed back with gold due to Hidden Cove. The Eagle managed to dismast the Roanoke and come to the BC’s aid when the Amity rammed the BC! With their gunship out of action and no gold on their ships or home island, it would be a tough road back for the AP’s in this game. The Eagle finishes off the Amity while the Bloody Jewel returns home with gold. The LS rescues the BC. The AP’s manage some gold as the Bandido returns home, but it’s only to avoid a shutout at this point. The Doldrums win 20-4! The AP’s went first in the second game, but the Doldrums still managed to hit the Roanoke and Amity with Becalmed on their first turn. The Eagle stayed home, anticipating the Roanoke returning to her HI, while the Doldrum gold runners were wary of the dangerous American 5 master. The Roanoke instead headed west, prompting the Eagle to sail out. 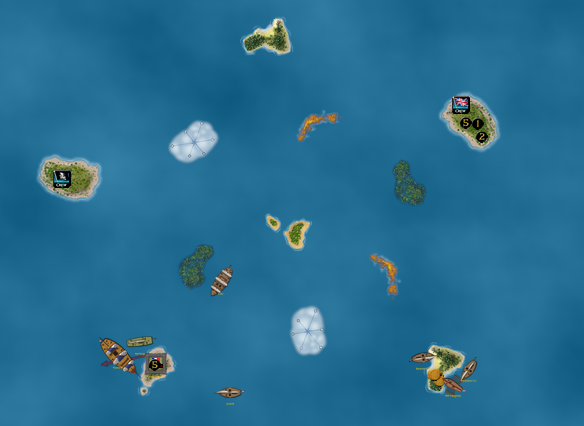 Suddenly 4 ships were near the center island! The Bloody Jewel unloads gold, while the Amity grabs some for the AP’s. Shots fired! The Eagle wasn’t able to hit anything with her first action, but by saccing she got lucky and took out 3 masts on the Roanoke! The Longshanks rammed the Bandido derelict, and combat was in full swing. Of course, in a game this small, it didn’t last long. The Eagle used another double action to dismast the Roanoke, while the LS towed the Bandido. This led to a strange situation where the Eagle purposely didn’t shoot at the Amity, since dismasting her would end the game. The Doldrums weren’t 100% sure they had more gold than the AP’s, so the Eagle sailed by while the Amity took some ineffective shots at the captured Roanoke. The BC engaged the Amity but failed her ram and was then dismasted. 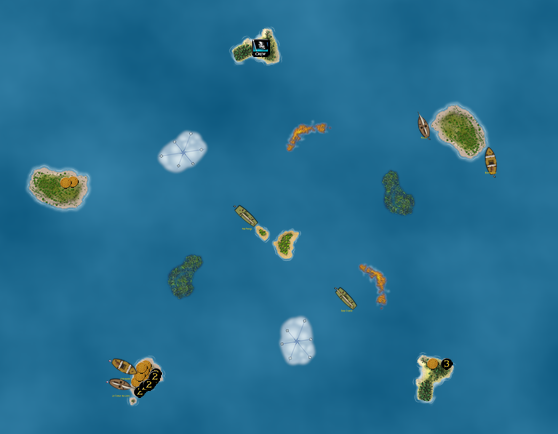 The home islands were relatively close together. I was very excited to return to my HPFF fleet, which is a variant on the UPS strategy. Of the 16 ships the two fleets had on the ocean, none had more than 2 masts. Throw in only a single captain ability (Captain Jack Sparrow), and it looked like the series wouldn’t feature much combat. What looked like it could be a quick game turned into a long affair…. This is the situation before the swarm fleet even took a turn. The Hai Peng has followed the HPFF strategy, building Paradis de la Mer on the center wild island. The UT Maps of Alexandria was found, giving both fleets the location of each UT and standard coin. 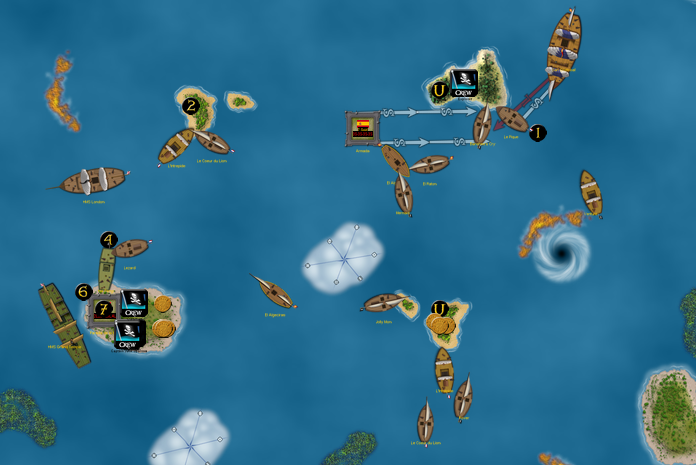 The HP (Hai Peng) loaded the traded oarsman and a coin, while the Banshee’s Cry headed for the southwestern island. Finally the swarm fleet could take its turn! 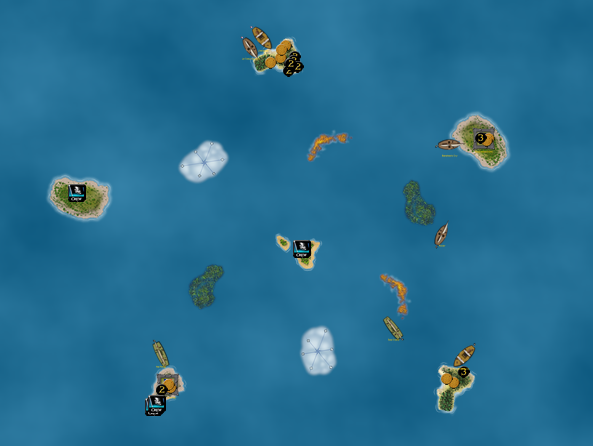 Here, the swarm fleet has set out, but the Hai Peng is at it again. The Devil’s Maw was built on the westernmost island, and the HP loaded another coin and the Holy Water UT. The HP then headed south to build Dead Man’s Point, the third fort on four wild islands! Soon afterward, things started to “devolve into chaos”, as I like to say. 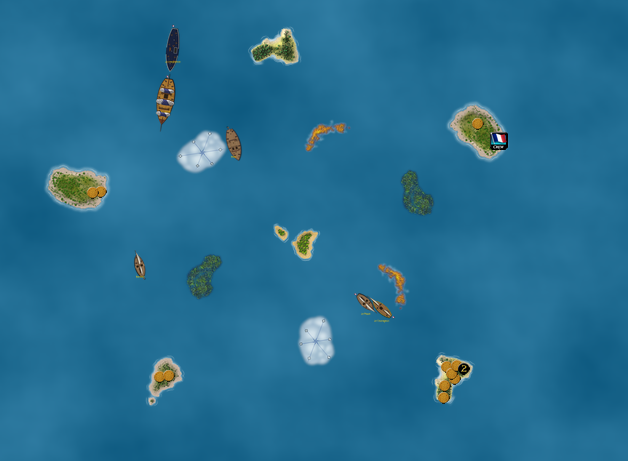 A few swarm ships got too close to Paradis de la Mer, who shot a couple masts off. The Banshee’s Cry went there to grab any extra coins not used for the fort’s construction. 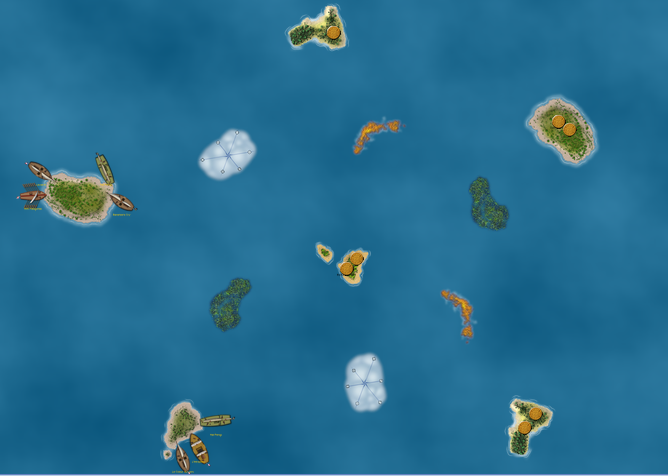 The swarm fleet mostly divided itself in two: a contingent of ships headed west to attack the Devil’s Maw, while another group headed south towards the HPFF home island. There, the Hai Peng had just docked home the coins she had picked up on her journey to most of the wild islands. However, she was soon under attack! The swarm fleet can utilize rams quite effectively, and this strategy began to pay off as the HP lost a mast. CJS was surprised to be in so much trouble at his own HI! It’s worth noting that the northern wild island was effectively irrelevant at this point, having been emptied by the swarm fleet. The swarm fleet took their turn, and the momentum began to shift! The sheer number of swarmers overwhelmed the Hai Peng and dismasted her via ramming! 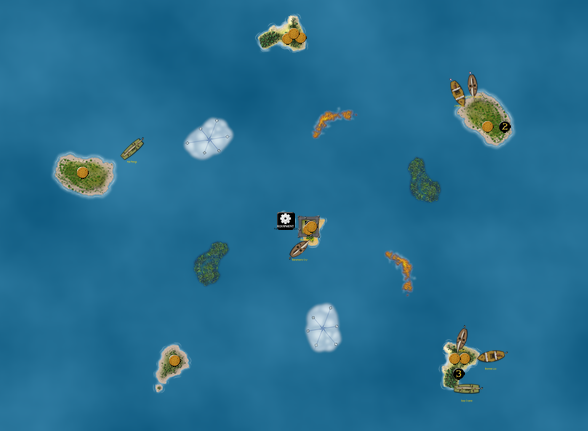 Then, in an expert display of seamanship, Xerecs used the swarm fleet to capture and chain-tow the Hai Peng away from the HPFF home island and out of harm’s way!!!! Chain-towing in a regular game, using about 6 total ships! (I sort of introduced chain-towing as a tactic back in my first 500 point game; it’s normally only viable in very large games so to see it here was epic.) At this point I commented that I was willing to lose despite my love for the HPFF fleet, simply because of Xerecs’ fantastic move and the honorable way of losing such a unique game. However, it was becoming evident that there was a lot of game left to play! The swarmers took up position in the far west against the Devil’s Maw, and began their bombardment! This was another unique feature of this game – a prolonged assault against a fort by multiple ships, something you’d be more likely to see in real life than in a game of Pirates. With the Hai Peng captured, Lord Mycron aboard the Patagonia can now give the extra action to the Banshee’s Cry. 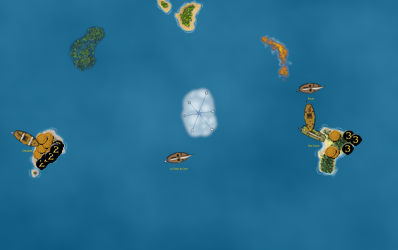 The BC zips home with an extra coin from Paradis, giving the HPFF fleet 11 gold on their home island. The Lezard sails out, the HPFF fleet desperate now that the HP is gone. The Devil’s Maw puts up a good fight against the uncaptained swarmers, dismasting two ships even as three more prepare to fire. The two battles continue to rage. The swarmers now concentrate some ships against the remaining HPFF ships. The Lezard and Patagonia are both dismasted by rams! The Devil’s Maw has knocked the western swarm squadron down to 2 masts, meaning that the fort has won the battle! Another rarity, as forts are often destroyed before they can even fire a shot when a fast gunship sails in and mauls them immediately. Between the lack of captains in the swarm fleet and the small size of the ships, the fort was in a uniquely good position. The Banshee’s Cry tries to get gold, while the Hai Peng is towed home by the swarmers. At this point, the only way for the swarm fleet to win is to get some of the gold from the forts. However, they will be hard-pressed to destroy all 3 with their lack of firepower. Both fleets continue to have some successes: the Devil’s Maw finishes off the swarmers in the west, and the BC uses Skrew Engine to duck into a fog bank with a coin. However, the swarm fleet sinks the Lezard and captures the Patagonia! This gives the swarmers access to Lord Mycron. Some turns later, and the Hai Peng has been repaired! She sets out for the swarm fleet, and is by far their best hope for them to destroy the forts, between her speed and CJS’s captain ability. Her first shots miss the Devil’s Maw, but Mycron can give the ship another action. 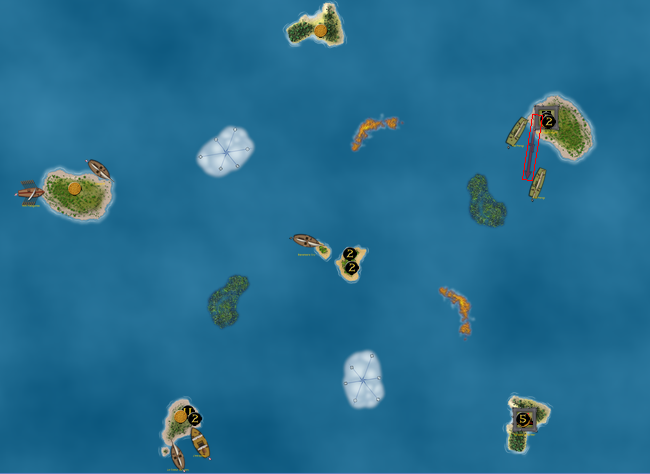 At this point the Pirate fort is down to 3 cannons and faces a more powerful squadron in this second battle, with more swarm ships arriving soon. A ship stands guard at the HPFF HI, where the BC needs a 2 or 3 coming out of the fog to dock home her coin. With 4 ships the swarm fleet manages to destroy the Devil’s Maw in the second assault! The Hai Peng is given the Patagonia’s action to load the 5 coin, which is extremely important. With two forts left, the swarmers will need some luck if they want to destroy both, especially against Paradis’ overpowered ability. The Banshee’s Cry has docked home a 3 for HPFF, and since she’s the only ship remaining in the fleet, she has become essentially invincible! If the swarm fleet dismasts the BC, the game immediately ends and the remaining gold in the two forts counts for the HPFF fleet, which would give them the win. Knowing this, the BC immediately rams the nearest swarm ship in the hopes of capturing and repairing it, but the hapless Venture sinks instantly! The Banshee’s Cry manages to capture El Raton and even the Patagonia! However, the Patagonia is quickly sunk after being recaptured, giving the swarm fleet an extra 1 gold from Bratley’s Ransom ability, which could certainly matter in this hotly contested game. In the south, Dead Man’s Point has already fallen! Some of the fort’s gunners fell asleep at their posts after the battle of the Devil’s Maw took so long, and the fort is quickly defeated. The Hai Peng tries to load the gold used to build the fort… and we suddenly realize that I had accidentally cheated! The BC’s entire trip to Dead Man’s Point earlier in the game was all for nought: I thought there were two 3’s in the fort, but in reality the 3 used to build the fort was the only standard coin on the island. Thus the coin couldn’t be removed from the fort, and we corrected the mistake by transferring the coin from my HI to the Hai Peng. I knew something was amiss when I counted 38 total gold in play (30 + 5 from Barbary Banner, + a mysterious 3 that I mistook for an extra coin when it wasn’t). The BC lost one of her two oarsmen instead of having the UT stolen, and now it was once again a regular 30-gold game instead of the one-time “38”! At this point I knew exactly what I had to do: with 11 gold on my HI, just hold Paradis (with a 5 coin inside) and I would win the game. Jailhouse Dog meant the swarm fleet would have to get the gold from Paradis after all, rather than just the Devil’s Maw and Dead Man’s Point. Despite being on the winning side of the UT in this game, Jailhouse Dog is still one of my least favorite UT’s because it can be OP and game-breaking. It’s one of the ultimate “party poopers” of Pirates CSG. With 2 of the 3 forts destroyed, it looked like the game would finally end soon. There was a brief scuffle near Paradis, which resulted in two derelict swarm ships. The Hai Peng hurried home with the gold from Dead Man’s Point (the real 3 that the BC never should have loaded heh), while the gunners at Paradis prepared for a final clash. In between the above picture and this one, the Hai Peng rammed the Banshee’s Cry at such an angle that the guns of Paradis couldn’t hit the HP. However, the Intrepide rammed the HP and forced her to retreat. The HP went home to repair one final time! At this point I had been playing the game and typing in the chat with one hand for a while due to eating. This led to many bizarre and amusing things in the VASSAL chat, and further contributed to this long and wacky game. The Hai Peng sailed out and dismasted the Intrepide, leaving the BC as the only HPFF ship once again. The Hai Peng tried to attack Paradis, but once the first die was rolled for Paradis’ effect, it was obvious that it was impossible for the HP to get enough hits. The fort’s guns boomed once more, and the Hai Peng was derelict! This seemed to end the game, but the swarm fleet still had the Jolly Mon at their home island! The Jolly Mon vs. Paradis de la Mer matchup didn’t happen for obvious reasons: the Jolly Mon would need an absolutely unprecedented string of luck to win, and even then a single successful ram from the BC would end the game as well. Hai Peng Fort Frenzy wins the game 16-15!! 11 gold was on their HI, with 5 in the intact fort. 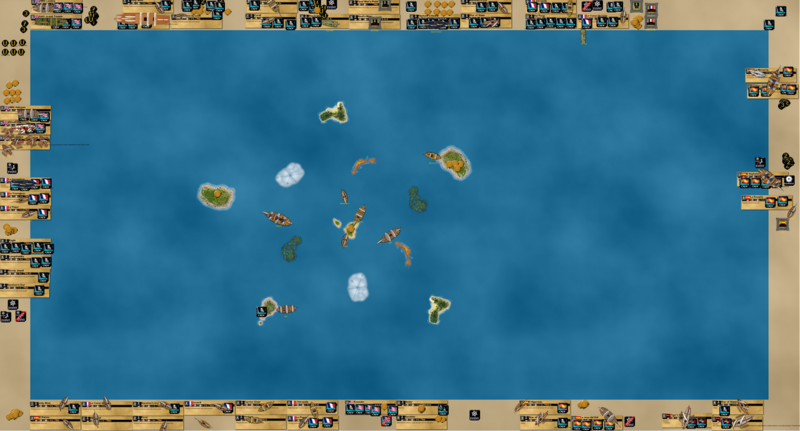 The swarm fleet had 14 gold and 1 extra from sinking Bratley. How fitting that one of the longest and most desperate 40 point games ever ends with a 1-gold margin of victory! This is a game we’ll remember for a long time, and continues the trend of the HPFF fleet having very long and interesting games: its first series (against the AP fleet ironically) was also quite memorable. After all that, we still have at least one more game left to play in the series! The HP was headed to the southeast (building Dead Man’s Point), where she found the Maps of Alexandria. By that point she had also loaded Holy Water and Jailhouse Dog. Paradis dismasted the swarm’s Banshee’s Cry, while the HPFF BC docked in the northeast. The BC used Skrew Engine to dock home a few coins, including the Barbary Banner. This time HPFF had found both the dog and the banner, giving them a decided advantage. It was already likely that HPFF would win, but they also had luck on their side. Xerecs’ cannons were ineffective, and DMP crushed all comers in the southeast. Here, the swarm fleet has some gold home, but they’re running out of ships. At this point the swarm fleet had to do the near-impossible: steal the Jailhouse Dog from the HP, use it to eliminate Barbary Banner, and then somehow destroy Paradis de la Mer to get the fort’s 5 coin. HPFF had 16 gold when counting Paradis’ gold but not counting the banner or the 3 in Dead Man’s Point. The Banshee’s Cry and Lezard were dismasted via rams but quickly repaired. The Hai Peng got involved in the skirmish at the HPFF home island, where she was actually dismasted by rams and forced to hand over the Jailhouse Dog! Xerecs immediately played it to eliminate the Barbary Banner, but after the BC and Lezard got revenge by dismasting two swarm ships, the swarm fleet almost certainly wouldn’t be able to destroy Paradis. Realizing that the Hai Peng could move S+L+S when derelict (oarsman + both bonuses intact from having a captain and helmsman aboard), I decided to take off, knowing I could repair at either fort but knowing that the HP would be captured if she stayed at home. 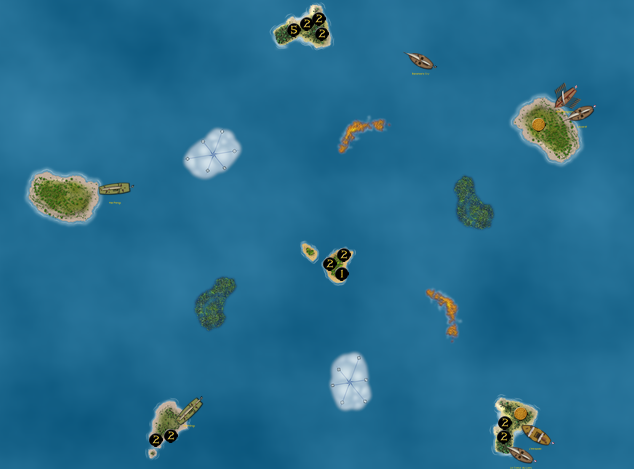 An overly lengthy endgame process saw the Algeciras capture the Patagonia, so Mycron gave the swarm’s Coeur some extra actions. The Carrion Crow took the BC and Lezard out, leaving HPFF with just the HP. That would prove to be enough however, as the HP repaired at DMP, then dismasted the Carrion Crow. With only 2 masts left in the swarm fleet, we decided to call the game. HPFF had a 14-8 advantage even without the forts, which made the final score 22-8. Hai Peng Fort Frenzy advances to Round 2! This was a bit of an odd matchup – a UPS variant against a fleet designed for deathmatch play. The Kettering fleet used the same nasty UT’s as the HMS Grand Temple fleet to maximize the competitive nature of the tournament. Darrin’s fleet rolled to go first, and I followed his strategy to a T. The fleet had 12 gold on its HI by the end of the first turn. CJS traded another coin home on the next turn, which was the final coin on the center island (Missionary was traded away on the first turn and the BC loaded a Monkey’s Paw). This gave the gold race fleet 17 gold, technically enough to win. 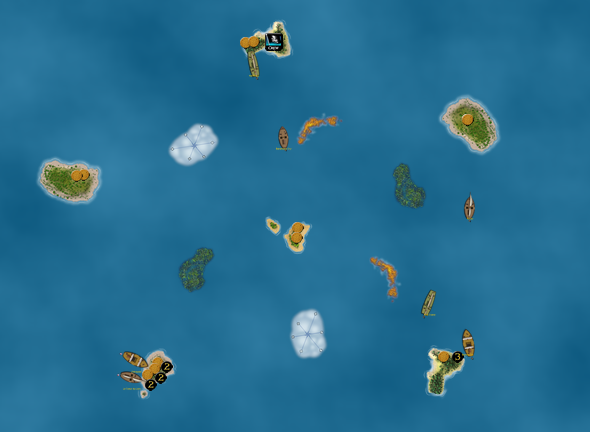 However, knowing that the BC had only traded away 8 total gold, there was 22 more gold out on the islands. To be fair we kept playing in the off chance that the Kettering fleet could come back, since the gold race fleet didn’t have a true majority of all the gold now in play (9 extra on their HI from the bonuses). The Rover turned around and rammed the Kettering! However, no damage was done. Then, in a bizarre twist, the Rover won the boarding party 7-6! A 2 point ship had just won a boarding party against one of the most feared ships in the game, and there was nothing the canceller ability could do about it! To continue the oddities, the Kettering then missed 4 shots in a row (partly due to Brent Rice having been eliminated in the boarding) before the Minuteman finally put an end to the mighty Rover. That whole sequence guaranteed the Banshee’s Cry another explore action at a different island, and it was over. CJS traded home a 7, which became a whopping 10 after the gold bonuses. Darrin’s gold race wins the first game of the series 27-0, the greatest margin of victory so far in the tournament and a higher margin of victory than any game from Tournament #1. This time the Kettering fleet went first, and the BC was unlucky enough to find 2 negative UT’s at the center island, loading Maps of Hades. The Rover was dismasted, and it was clear that the BC would have to do some sailing (rather than just “Hidden Cove’ing” to the island and redocking) in order to win the game. The BC needed more regular coins at the center island rather than UT’s. Negative UT’s may be the most reliable way to slow down these UPS fleets, since treasure traders like Gilbert can only toss away one at a time. Even then, there’s a chance you’ll get another bad one in the exchange! Here the Sea Crane is being towed by the Kettering for her gold and gold bonus ability. The Bonnie Liz has gotten the Rover back in action, and they look to ram and steal before it’s too late. The Bonnie Liz actually managed to steal a 7 from the Sea Crane, but it was promptly retaken by the Algeciras, who gave it to the Sea Crane to get the +1 bonus. The Rover was smashed again, while the Bonnie Liz tried to commit suicide on a reef in order to force the game’s end, simply hoping for enough gold to win. However, it would have been too late anyway, for the Kettering fleet won the game 22-9! The Banshee’s Cry had to make a run for a second island, while the Rover tried to hold off the Kettering and the Sea Crane left her HI. With Wolves making some of the gold unavailable, the game was soon decided. Darrin’s gold race had won a close 21-16 victory and advances to the second round of the tournament! I didn’t take many pictures, but the Bonnie Liz ended up as the last ship in the gold race fleet once again. 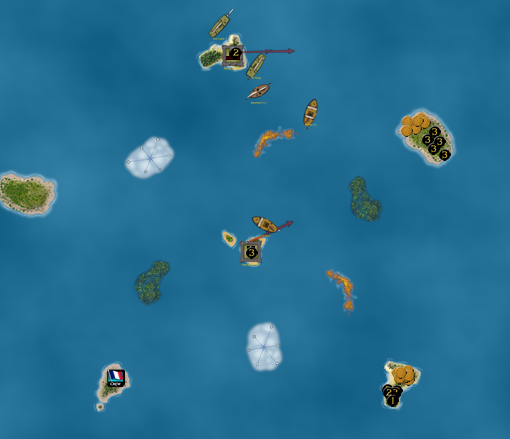 This time, the Bonnie Liz managed to do a suicide run onto a reef to force the game’s end, knowing that her fleet likely had more gold than the HMS GT fleet. This was correct, as darrin’s fleet won 15-6. There are no pictures from the second game of the matchup, because there doesn’t need to be. The gold race fleet rolled to go first (after going second in the first game), and the Banshee’s Cry managed to find only standard coins on the island she was Hidden Cove’d to! This meant she could simply trade 4 coins home in 2 turns and get the +3 bonuses on all of them. There was no need to scramble and no need for a second island. With 13 regular gold on the HI, there was only 17 gold available for the GT fleet. However, with 12 gold in bonuses in addition to the 13 standard, there was absolutely no way for the GT fleet to win. Darrin’s gold race wins 25-0 and advances to Round 3, the semifinals! The #1 seed is out of the tournament in an upset! It wasn’t hugely surprising, since the gold race fleet is a UPS variant and the HMS GT fleet is built for combat. 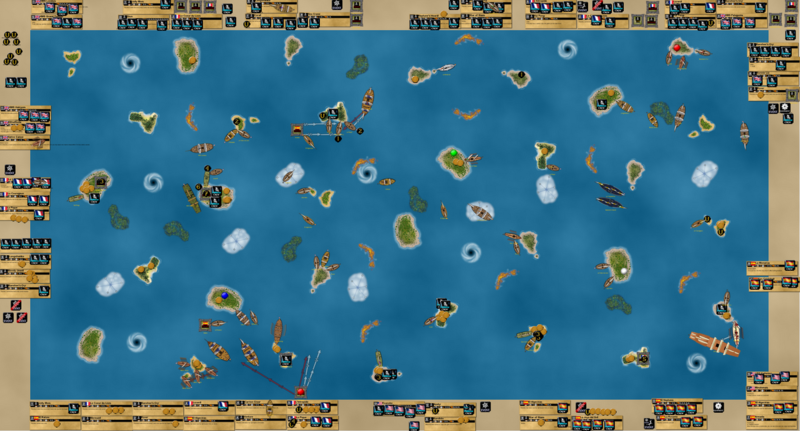 The perfect scenario combined with going first let the gold race fleet attain an easy second victory. Both fleets quickly got to work, with HPFF building Paradis de la Mer in the center and the Devil’s Maw in the north, and UPS 5 building their Devil’s Maw in the west. UPS 5 found better coin values. Here, HPFF has gone to the southeastern island, but the Zeus has destroyed their Devil’s Maw! With the remaining gold contained within the two forts, there wasn’t much HPFF could do with their lack of firepower. The Lezard blocked the Zeus temporarily while the Hai Peng sped off in an attempt to destroy the Devil’s Maw to get at the gold inside. The Banshee’s Cry looked to take out the Hag of Tortuga. The BC succeeded, but was dismasted for the effort. The 1 extra gold would not be enough to make the difference for HPFF, whose Hai Peng managed some damage against the Devil’s Maw before being destroyed. UPS 5 had won the first game of the series 17-12! One turn into Game 2. HPFF’s home island is in the southeast, with UPS 5 in the west. The HP made it to the northern island, finding Pirate Globe, Jailhouse Dog, and two of the three 5 coins. Indeed, the luck had reversed from the previous game in terms of gold. To make things even better for HPFF, the Barbary Banner was revealed to be in the east, where the BC was headed. A few turns later and HPFF is able to get what they need home. 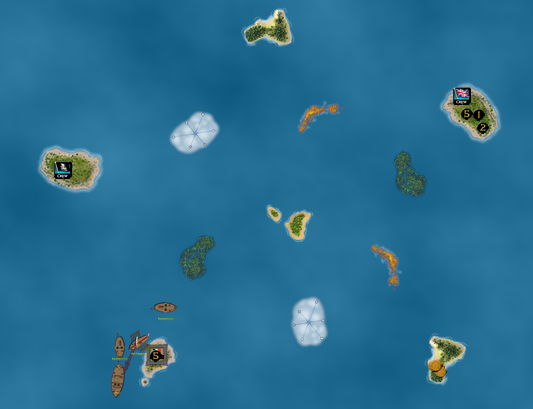 The HP avoided building Paradis on the northern island because it would put the valuable gold back in play, where the Zeus could potentially get it. 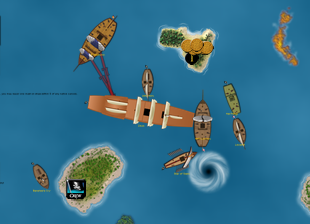 After a loss in the first game, a change in strategy was just what the HPFF fleet needed, and here it panned out nicely (normally it’s better to just build the forts, but with a Zeus moving L+S+L+S the gold is not safe for long at all heh). UPS 5 almost managed a late-game salvage operation: I had kept the Jailhouse Dog aboard the Hai Peng in case it was needed, but suddenly it became a huge liability since the Zeus could steal it and use it to eliminate the Barbary Banner, which would cost HPFF the game! Thinking quickly I did something unorthodox and eliminated one of my own positive UT’s, Holy Water. This was simply to eliminate the dog from play to deny UPS 5 from using it. Indeed, the game turned out closer than I expected, but HPFF won 18-17 to even the series at a game apiece. The Hai Peng sprinted to the northern island, once again finding the Pirate Globe, and this time the Barbary Banner as well. The Zeus went to the center island before turning to the northeastern island, where the Jailhouse Dog was. I then had to think about the best course of action for my fleet – I originally was going to run home with the Barbary Banner and the other coin the HP was carrying. However, seeing that the Zeus would soon come into possession of the Jailhouse Dog, and knowing that the UT could eliminate the Banner even after I docked at my HI, I decided to do something more risky but also more wise. The Hai Peng took off for the same northeastern island the Zeus was headed to, which could have been a suicide move. The HP docked on the side opposite the Zeus to maximize how far the junk would have to travel to get in range, and picked up the Jailhouse Dog, immediately playing it to eliminate the now-useless Maps of Alexandria UT on the western island. The Hai Peng picked up the Banner, and traded a 5 from the island for an oarsman on the Banshee’s Cry. The BC, originally headed for the western island, now turned around and docked home the new 5 coin, giving HPFF two of the three 5’s. 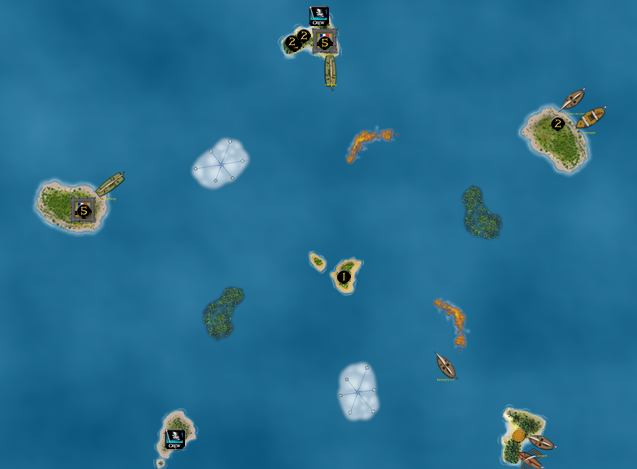 To finish the turn, one of the 5’s was transferred back to the northeast to build Paradis de la Mer, both in an attempt to deter the Zeus from attacking the Hai Peng/Barbary Banner, and to protect the final coin on the island. Not trying to brag but it was one of my best turns of the tournament and a fine example of how strategic this “beer and pretzels” game can be, and why it’s always best to think things through. In the end I had essentially swapped 5’s while protecting my end of the gold in play, since it was likely the Banner would be sunk or stolen, but that the 5 would remain in play for at least some time inside Paradis. Had I ran home, I would have lost the Banner immediately and not gotten the 5 in the northeast. The Zeus decided against attacking Paradis and a double-action Hai Peng, turning to the western island instead. The HP used an action to trade home the 2 from the northeastern island, then used her second action to move towards home, careful to stay out of the Zeus’ range. The Coeur came out to meet the Hai Peng, but was unsuccessful with a ram and board. The HP sought shelter within a fog bank, while the Zeus unloaded her gold and combined it with the gold on the western island inside the Devil’s Maw fort. Seeing the endgame conflict materialize, the Banshee’s Cry headed to Paradis. And there you have it – HPFF isn’t willing (or capable, likely) to go after the Devil’s Maw (and has no reason to), so the Zeus heads east to destroy Paradis. The 5 coin inside will determine the winner of the game – HPFF was up 21-14 at this point in gold, which could be determined by the revealed gold and the lack of extra gold in play outside of the Barbary Banner. It looked like the Coeur was sailing out to join the Zeus, but the HP sank her quickly. HPFF’s strategy was to stop the Zeus from destroying Paradis and loading the 5 coin in a single turn. As long as that didn’t happen, the HP could scoot to the island after Paradis fell, and then simply trade the 5 home (the Lezard still had 2 oarsmen aboard) for the instant win. The advantage laid with HPFF, but the situation was tense and competitive. The BC maneuvered to block the Zeus at her bow, which in hindsight was a mistake because the Zeus could stay in place and shoot at the BC without coming into the range of the fort’s guns. The Zeus did just that, but managed to go an abysmal 0 for 4! This gave the BC another chance, which she used to dock at the island on the side where Paradis was closest to the water (with her stern sticking out as far as possible). This new blocking method was designed to force the Zeus to go to the far side of the island and shoot at Paradis from longer range, reducing the number of effective guns. The Hai Peng observed everything, ready to pounce on the Zeus with a double action (4 shots) or grab the 5 if the Zeus got lucky against the fort. Incredibly, Xerecs rolled a 6 for Paradis’ ability, meaning the Zeus had to hit the fort 6 times that turn just to damage the fort at all! After this was not accomplished, Paradis knocked down 3 masts on the junk. The Banshee’s Cry has departed the island, hoping to get revenge when the Zeus becomes weaker. Quick went first, with the Courageux being Hidden Cove’d to the center island to explore. The Pique headed east, while the Vengeance prepared to protect either gold runner while also trying to make sure that no two ships would be in range of Becalmed at the same time. Alas, it didn’t work, with the Pique and Vengeance getting hit with the event. 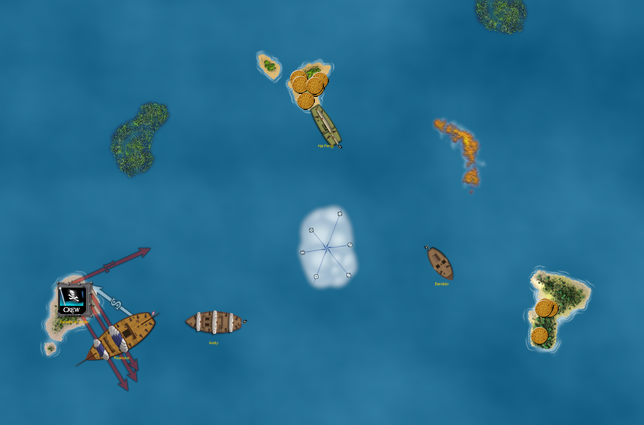 I had forgotten that the Doldrums fleet also had Hidden Cove, and suddenly the Eagle was at the center island and attacking my fleet! The Courageux and Vengeance lost a mast apiece, but Becalmed was an even bigger problem. The Vengeance connected on my turn, but was unable to move and get canceller Lenoir in range, while the Courageux’s ram and board failed miserably. The second game went similarly great for the Doldrums, and similarly horrible for Quick. The Vengeance stayed in port, so the Eagle couldn’t shoot at her if the same Hidden Cove strategy was used. However, this allowed Becalmed to hit two ships on the first turn once again, and it looked like the Vengeance should have moved northwest. 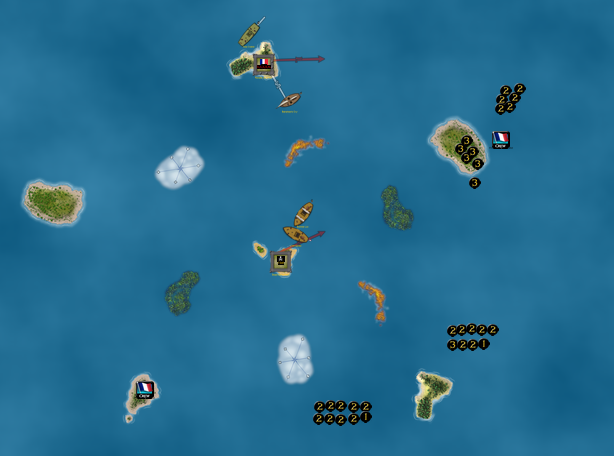 This time the Pique was Hidden Cove’d to the center island, the French changing their strategies after the embarrassing loss in Game 1. Becalmed was played to hit the Vengeance and Courageux. Hidden Cove was then played to put the Eagle at the center island once again, where she wreaked havoc. The Pique was sunk, while the Courageux was dismasted soon afterwards. This left the French to seek Vengeance (ha ha… or not). The Vengeance got caught up in a skirmish with the Longshanks, which further proved how much momentum the Doldrums fleet had, for Xerecs even rolled much better at the guns during the engagement. The battle was ended by the Eagle, with the French eliminated for the second game in a row! The Star of Siam and Banshee’s Cry didn’t have enough firepower to destroy Dead Man’s Point, and both ships were dismasted to end the game! UPS 2 won the game 27-21. Norvegia went first in the second game, using sac actions to reach two wild islands. The Hai Peng settled for the northwestern island, finding good gold values there (4,3,2,2). UPS 2 didn’t build a fort, planning to send home the islands’ final two coins on the following turn. After much excellent treasure running by both fleets, it looked like it was going to be a close finish. 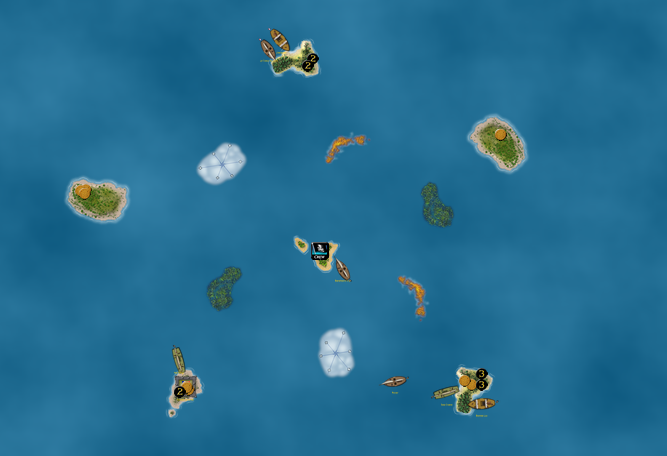 Norvegia found all of their UT’s (Spices, Barbary Banner, and Buried Treasure), while the Hai Peng was busy trading home coins from the northeastern and center islands. The last coin on the NE island was a 1, and CJS knew there was no point in getting that coin when he could try for a potentially better (and definitely not worse) coin with the final treasure of the center island. (UPS 2 had to pick one coin and not the other because the HP’s helmsman had been sacced recently so the HP could explore the NE island right after docking, and because the Neptune’s Hoard could catch the HP with her speed on Norvegia’s turn.) The decision paid off when the coin was a 2, which CJS traded home. The Hai Peng was dismasted by the Neptune’s Hoard, while the Banshee’s Cry docked home the final 1 coin for Norvegia. In the end, UPS 2 had won a very close 27-25 victory! This reveals how important it was that the HP switched islands at the end, for if CJS had traded home the 1, the game would likely have ended tied at 26! For me it was one of the best treasure running games I’ve ever seen, with a whopping 22 extra gold in play by the end of it (12 from Maurice Aristide’s +2 bonuses, and more from the UT’s). Another weird stat is that Norvegia totaled 46 gold between the two games and still lost both! It seems that UPS 2 is always involved in very high-scoring affairs; they just happen to score more than their opponents. Here is the updated bracket, with just 3 matchups left! At this point, we may play more than 2 or 3 games per series, if there’s any doubt about which fleet is superior, similar to what we did in the last few series of T1. Round 2 saw some VERY interesting series, with both the #1 and #2 seeds being knocked out. I’m not overly surprised at the left side of the bracket, as I had UPS 2 as the potential winner before the tournament started, and the gold race fleet not far behind. However, the right side of the bracket is a little more surprising, with HPFF knocking off UPS 5 in a close series. The Doldrums fleet has been the most dominant of the tournament, outscoring its opponents 61-12 (! ), going 4-0, and often finishing games rather quickly. I hope Becalmed doesn’t effectively ruin the tournament… either way, these semifinal matchups look very competitive and intriguing. It’s also worth noting that the Doldrums fleet is the only fleet remaining that has a functional gunship… not overly surprising, but in the past I’ve seen different HMS GT fleets absolutely steamroll great gold fleets (which just speaks to how amazing Darrin’s gold race fleet really is). A grand mistake has been made… an embarrassing error that threatens the integrity of the tournament…. The first of two semifinal matchups began, with Hai Peng Fort Frenzy (HPFF) facing the Doldrums fleet. As usual, the Doldrums fleet was cruising along, indeed on their path to an easy 17-2 victory for a nearly unprecedented 5-0 record. Early in the game the Hai Peng returned home to avoid being hit by Becalmed and then the Eagle, who would be Hidden Cove’d to the center island and then given a sac action to move and shoot twice. The Banshee’s Cry then moved into a fog bank, which prompted Xerecs to wonder if the fog would make the BC immune to Becalmed. I figured as much since I thought that lines of sight/ability/etc were blocked by fog. 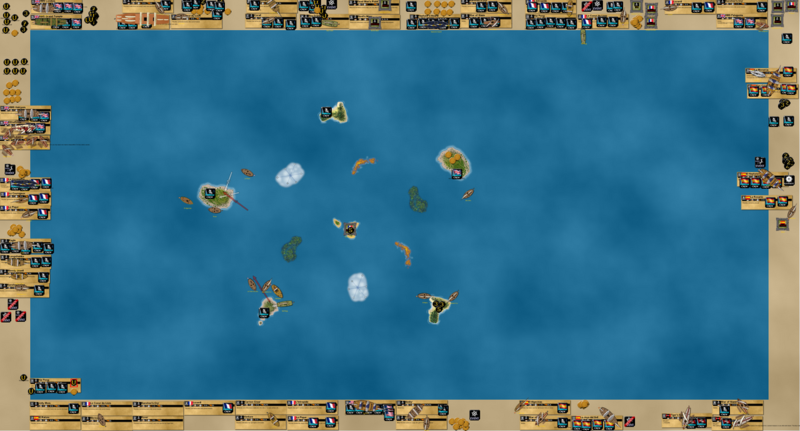 The game continued, and here you can see the Eagle in the southwest after sinking the HP, essentially ending the game in favor of the Doldrums. Suddenly the Doldrums’ 5-0 record was in doubt. Not only that, but their position in the tournament. One more win would put them into the final round, where a series victory would give them the title of “best fleet of all time”. It became very apparent that controversy and scandal would win the night, but with T2 being a somewhat serious affair (we have to get it right), we were determined to fix what we could. However, on the next turn the Roanoke sank the Eagle! It became clear that playing Becalmed and Hidden Cove on the first turn hadbeen giving the Doldrums fleet quite an unfair advantage. The Roanoke sank the Bloody Jewel, while the Amity and Bandido eventually returned with gold for the AP’s. The Roanoke was then set upon by the Longshanks (LS) and BC of the Doldrums fleet, until she was dismasted and captured! The Amity repaired two of her three masts before setting out for the final coin on the southwestern island. The Bandido followed her into a fog bank, while the remaining Doldrums fleet looked to intercept. The BC was rammed out of the game, while the Roanoke repaired. Eventually the Bandido rammed the final mast off the LS and captured her, towing the ship to block the Roanoke from attacking the Amity. The Amity returned the coin home and the American Pirates had dealt the Doldrums fleet their first loss! The final score was 17-15 after finding out that Raft had no effect on the Hag of Tortuga; she became 1 gold for the AP’s when the Eagle sank. This time the “Hidden Cove chess game” resulted in the Roanoke besting the Eagle once again. Here I made another mistake (one of many this session) and pulled the gold runners out of the fog too early. The Vengeance turned around and dismasted both of them in one action! Now the AP’s would have to win with just the Roanoke. With no helmsman, the Vengeance could only tow the Courageux at S speed, allowing the Roanoke to get in range of the Courageux while being out of Lenoir’s cancelling range. 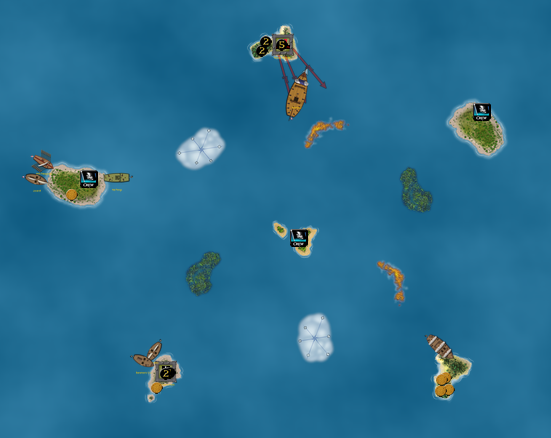 The Courageux was sunk, and the Roanoke won a brief battle of the gunships to end the game. The AP’s win 8-4! Here is the updated bracket, with Eventgate over. The AP’s went from being eliminated to being one win away from a trip to the semifinals (if they get there, they would face HPFF, which would be an extremely highly anticipated rematch for the ages). At the opposite end of the spectrum, the Doldrums fleet proved to be a lot of hype for nothing. This also gives the Quick fleet new life, though now they have to win 2 in a row to advance. The AP’s were very aggressive with Hidden Cove, using it to catapult the Roanoke towards the French gold runners. The Vengeance headed south to cut off the Bandido and Amity on their second gold run. Seeing no chance of getting the gold home, the Pirates turned to attack! An impressive ram and board from the Amity (two 6’s in a row) hurt the Vengeance a little, but things were still looking dire for the AP’s. 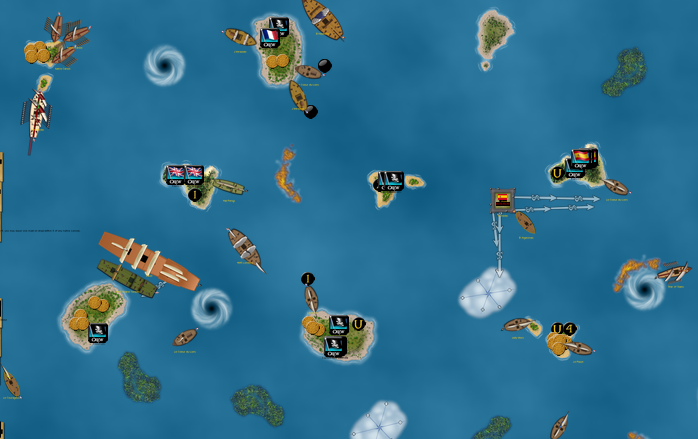 After the Bandido was sunk, the Amity put up a rather miraculous fight against the Vengeance, though it was more due to the Amity carrying the final AP mast (Quick needed to make sure they had more gold before triggering an endgame condition) than the excellent exploits of the Amity and her crew. The AP’s built a Devil’s Maw in the west after capturing the Vengeance and her two coins from the same island. However, the Courageux was going to the northern island once more, and gold bonuses were already stacking up on the Quick HI. As expected, the AP’s used Hidden Cove to get the Roanoke out of Lenoir’s cancelling range. With careful maneuvering and a sac action, the Roanoke was able to knock down the Vengeance’s final two masts and capture her! The Courageux explores the Pique for her 1 coin, eager to unload it to get Aristide’s +2 bonus. They plan to do the same at the northeastern island, which would give them 20 gold total (which they are aware of because they’ve explored two islands and found both 1’s, and know the treasure distribution based on the previous games). However, the AP’s would have 21 if they unload all of their gold (16 between the Amity and Bandido) as well as Cissey, who would provide 5 via the Ransom keyword. Thus, the French must make some kind of daring attempt to limit how much the AP’s bring back. The Pique was going to capture or sink the Amity, but Captain Blackheart on the Roanoke had other plans. At this point I forgot about the “new” oarsman keyword ruling, where you can’t tow a ship if it has an oarsman. The Amity was towed a little bit by the Roanoke, but she could have just hidden in a fog bank or made it on her own anyway. The Roanoke could have dismasted the Pique instead of the Courageux to avoid forcing the end of the game and the treasure count, at which point a similar situation would have unfolded at the end of the game. In addition, the Roanoke would then have time to load the Amity’s oarsman for sacrificial purposes and also to tow the Amity. Here are the pictures from the rest of the game, which the AP’s won 21-17. It’s extremely likely they would have won anyway, but I’m playing another game for maximum fairness. 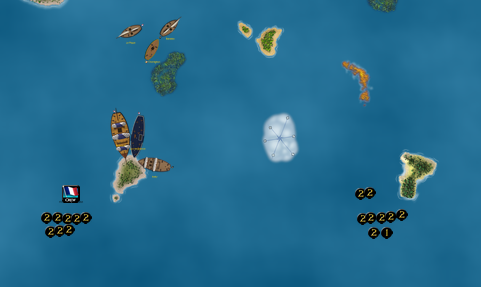 In the other game, the same home islands were picked with Quick going first. The Roanoke used Hidden Cove to go to the center island and attack the Vengeance, hitting 2/3 times. The Vengeance fought back and cancelled Blackheart, but eventually lost the fight. The Amity beat the Pique to the northern island and the AP’s won in a shutout. With that, the American Pirates move on to Round 3 of the tournament, the semifinals! There they will face Hai Peng Fort Frenzy, in an epic rematch! But first, the other matchup will be played: Darrin’s Gold Race fleet vs. UPS 2! This matchup pitted two fleets that use Captain Jack Sparrow against each other. 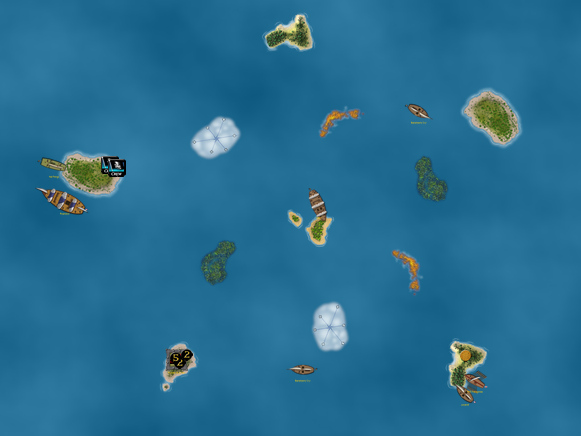 Each has Hidden Cove and CJS on a very fast flagship (Banshee’s Cry and Hai Peng). The games didn’t disappoint! Xerecs also got a crash course on the gold race fleet, which I consider to be the most confusing fleet ever made. The first game was marred by a UT problem. 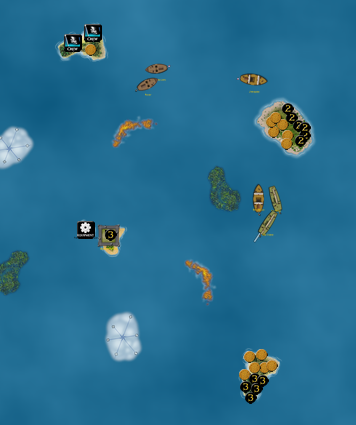 The gold race fleet has Periscope listed (Sunken Treasure was already taken out based on past problems with including it), but the Hai Peng (HP) found it. 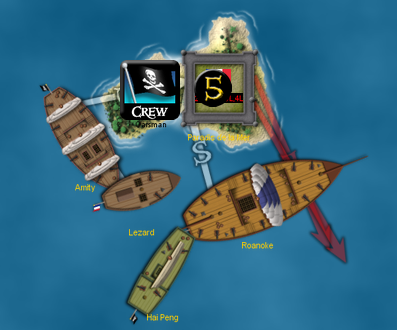 The Hai Peng used a double action (saccing with Jimmy Legs) to activate the UT and cancel Jonah aboard the Banshee’s Cry (BC), shutting down the crew and therefore forcing the removal of both Captain Jack Sparrow and Don Pedro Gilbert, two extremely essential crew for the gold race fleet! They were tossed overboard, and meanwhile the Hai Peng’s CJS was busy ordering the gunners to open fire, leaving the BC derelict. From here it looked like UPS 2 would have an easy ride to victory. The HP teleported two coins home from the northern island, getting bonuses on both. The gold race fleet was forced to sail out their remaining ships, with the Banshee’s Cry useless and later scuttled. After clearing out the western island, the HP headed east to intercept the final coins sailing home in the opposing fleet. However, she lost a skirmish and was captured! Here the Bonnie Liz transfers individual coins to the Sea Crane, who redocks to get a +3 bonus on each coin. This was the gold race’s best chance at victory, and it could work as long as the rest of UPS 2 (Intrepide and Coeur du Lion) couldn’t interfere. The second game started, with the gold race HI in the southeast and the UPS 2 HI in the northeast. The BC has built Dead Man’s Point in the center, dumping her French Letter of Marque equipment to make room for more sacrifices. The HP tries to steal the BC’s coin, but manages to lose the boarding party! The Sea Crane stays docked to protect her valuable gold bonus crew. This makes Genny Gallows (aboard the Sea Crane) a “stay-at-home mom”. (I wonder what Sean thinks of that? ) The Bonnie Liz sails to the fort and grabs the gold there. The Rover stalks the Intrepide and Coeur up north. 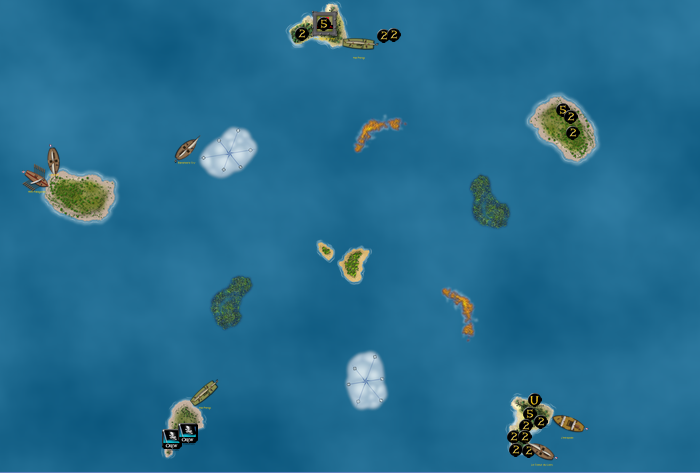 In the ensuing skirmish (not quite “chaos” between a few small ships heh), the Coeur was sunk and the Rover recaptured. The Intrepide got a coin home but it probably wouldn’t be enough. The gold race fleet was in full control, but didn’t want to end the game since they could still get the final coin on the northern island and +3 bonus it. (4 gold vs 1 from Cissey’s elimination; capturing Cissey would end the game with no chance to unload him) The Intrepide initially tried to suicide on a reef, but then began fighting Dead Man’s Point. In a brilliant move, Xerecs used the captured Hai Peng to load up an oarsman and the CJS that was originally on the BC (so the HP had two Jack Sparrow’s on her during the same game – Multiple Jacks like in At World’s End!!). Then he used Jimmy Legs to sac the oarsman and redock, NOW using CJS’s ability to flip the coin to the Sea Crane way in the south, who unloaded it for 4 gold total. 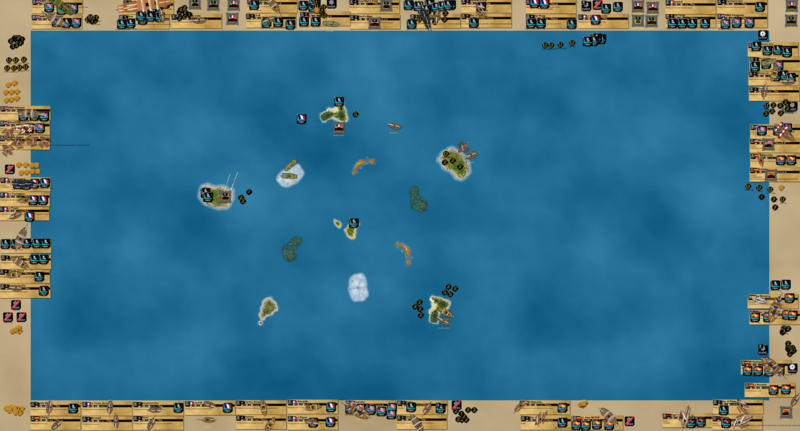 To end the play, the gold race fleet was now free to end the game, and that they did, with the fort blasting the Intrepide apart and getting 1 gold from Cissey’s elimination. Once again the BC built Dead Man’s Point on the center island, which forced the Hai Peng to go around the perimeter. 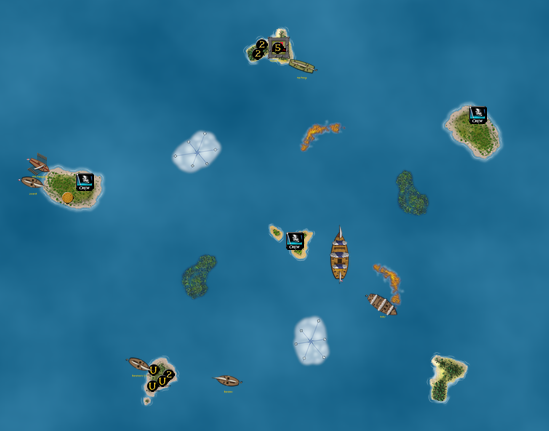 The HP was Hidden Cove’d (copyright lordstu) to the southwestern island but skipped it entirely, sailing north to the western island. The HP and BC got busy trading, with the HP continuing to circle the center island by moving to the northern island, much to Xerecs’ dismay. Paradis was built on that island, and the BC turned away. The sickening speed of the Hai Peng was soon on full display. She sent another coin home before saccing to dismast the Rover, and then moved on to the southwestern island (finally returning to it) on the next turn. Honestly, sometimes there’s just not much you can do against a ship like the Hai Peng with the right crew setup. Here is when it happened. The Banshee’s Cry scored a hit. With CJS aboard and desperate times calling for desperate measures, the BC somehow dismasted the HP with a shot and ram! Importantly, the BC stole back the coin the HP had stolen from the Sea Crane. The Bonnie Liz came out to help the Sea Crane, while the Intrepide and Coeur looked on from afar in confusion and disbelief. Then, another bizarre thing happened. While attacking the Coeur, the Banshee’s Cry couldn’t shoot due to carrying treasure, the same treasure that she stole partly as a result of her earlier hit. Paradis is massively overpowered and unsurprisingly put up a great fight against the gold race coalition of 4 ships, besting all 3 comers! To complicate matters further for the gold racers, the Intrepide had just finished taking out the guns of Dead Man’s Point, so it would only be a matter of time before she loaded the fort’s former gold and sailed it home for a reversal of fortune and momentum. The Bonnie Liz put a stop to all that by ramming the Intrepide to end the game! Between that (averaging gold scores in the 30’s, like what??) and the overall effectiveness of the strategy, these are absolutely two of the best fleets of all time. It’s interesting that UPS 2 holds a 2-1 advantage despite the gold race fleet going first in all 3 games, but that was partly due to the Periscope situation in Game 1. The future holds more excitement, for at least one more game will be played between these two fleets. The winner of the series advances to the finals! My horrendous dice luck continued at a near-unprecedented rate, starting with losing the roll to go first. 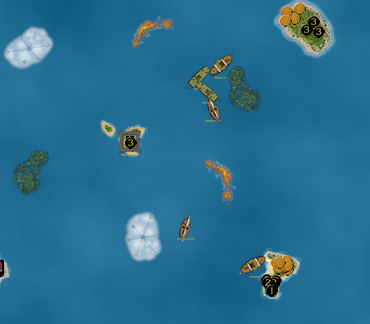 The gold race fleet uses Hidden Cove to send the Banshee’s Cry to the center island. The Hai Peng was Cove’d to the western island, and she continued south from there, exploring two islands in the same turn. UPS 2 built Paradis de la Mer, and the gold race fleet responded by building Dead Man’s Point in the northeast. This is where things started to get interesting – with a scarcity of crew to trade with Captain Jack Sparrow, both fleets would need to scramble to secure victory. The Hai Peng lurks in wait for the Banshee’s Cry and/or Rover, who could be coming home with gold soon. Suddenly all ships of UPS 2 are headed home, as I realized the HP could simply tow the Sea Crane back at S+L+S speed. In addition, the 5-gold payout from the Hag’s Ransom keyword was greater than the potential 3 the HP could get at the southwestern island. Finally, it allowed the Intrepide to go back home and not risk being vulnerable to the gold race fleet while towing at S speed. The HP repairs and speeds out to the southwest, where she trades home the final coin that she had found earlier. Then UPS 2 appears to sail straight for Dead Man’s Point. Battle for the fort! My die rolls continue to defy belief, and Dead Man’s Point and the gold race fleet quickly gain the upper hand. Before the Rover was dismasted by a shot from the HP, a ram roll failed with a 1. You really can’t make this stuff up. Eventually 3 of the fort’s 4 guns were silenced, but not before the HP was captured and most of UPS 2 dismasted. Xerecs didn’t have amazing die rolls this game, but naturally the Banshee’s Cry hit once again with a 6 to dismast the HP. (An outsider wouldn’t be crazy to think that the module is biased against me.) A final shot rang out, and the game was over! The series is now technically tied at 2-2, but it’s more like 2-1 in favor of the gold race because of the Periscope dilemma that ruined the first game. However, UPS 2 still hasn’t gone first in any of the games. Between these factors and the close scores, it’s incredibly unclear which fleet is superior. Stay tuned for more! Turns and turns of furious treasure-trading and gold bonus applications went by. There wasn’t much the gold race fleet could do about the UPS 2 forts, and the game was truly a gold race. In the end, UPS 2 won the game with an insane score of 44-21! 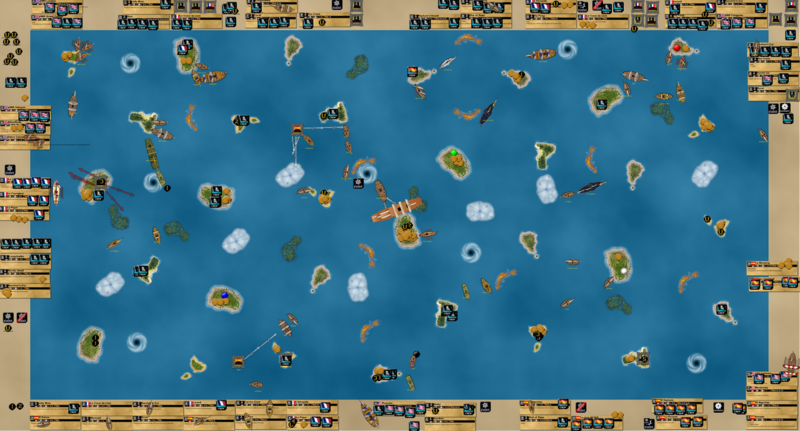 This is a new single-fleet high for gold in a standard game that we have played, breaking the previous record of 38 set by the gold race fleet in Game 4 of the series. Due to eating and an imminent time crunch, we didn’t do Skype or a video for the second game of the session. Since the gold race fleet had gone first in more games (3 to 1 even if you don’t count the first game which was marred by the Periscope incident), UPS 2 went first once again. The home islands were swapped, with UPS 2 in the southeast and the gold race fleet in the west. Both fleets built Dead Man’s Point in the north! Knowing I had to get moving in order to prevent the Rover from getting gold in the southwest, the Hai Peng used one turn to build Paradis de la Mer on the center island, and the next turn to build the Devil’s Maw on the southwestern island right before the Rover would have been able to explore. This meant that all wild islands had a fort on them! 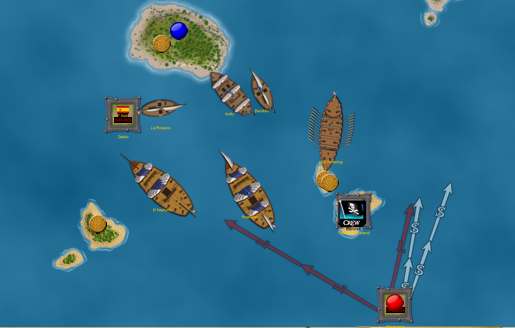 The Dead Man’s Point is the easiest target for the gold race fleet, who must destroy at least one fort and get its gold to have a chance. The Intrepide sails out to meet the HP and get a double bonus from Spices after a treasure swap. I dismasted the Rover with the intention of capturing her, thinking she might be useful down the line if the game came down to a battle to the death at a fort. The Intrepide got yet another bonus via Aristide, and the Coeur rammed the Bonnie Liz unsuccessfully. The firepower in the northwest eventually subdued the BL and Sea Crane, while the Hai Peng chased down the Banshee’s Cry and dismasted her to end the game! In one of the most highly anticipated series of all time, an epic rematch is taking place!! I knew this was a possibility from how the bracket was structured, but I can hardly believe it’s actually happening. Similar to darrin’s fleets facing off in the other semifinal matchup, my best two fleets I’ve submitted go head-to-head with huge stakes! The Hai Peng has explored the two western islands, building Paradis de la Mer on the southwestern one. She unloads Barbary Banner at home, while the Roanoke sinks the Banshee’s Cry. The Amity explored the northeastern island and flipped Jailhouse Dog to eliminate the Barbary Banner. Knowing I’d need more gold, the HP scurried past the Roanoke to explore the northern island. However, the Roanoke’s boarding party kills Lord Mycron, which puts a severe dent in the HPFF game plan. With a considerable ship and mast advantage, the AP’s capture the Patagonia, hoping to unload Bratley for the 5 gold Ransom payout. However, the Hai Peng is too fast for that! Although she missed when redocking at her home island, the HP managed to try again on her next turn. The second shot connected, sinking the Patagonia and denying the AP’s the ransom. At this point, only the 5 coin in Paradis remained. The AP’s would give it up if they sunk the HP, and therefore the HP became essentially invincible for the endgame. The Roanoke and Amity headed over to the fort, but the Roanoke rolled a 5 for the ability and thus was only able to eliminate one cannon even after saccing for a double shoot. Paradis was simply too much for the AP’s to overcome, and the game ended after the Roanoke was sunk and the Amity was dismasted. That gold in the fort was the difference, as HPFF won a 18-13 victory in the first game of this highly anticipated rematch! It was a great game, with more to come soon. In fact, we’ve already started the second game, which you can see part of if you check out the video on my channel. For the second game of the series, the AP’s went first and HPFF’s HI was moved to the northwest. The HP builds Paradis in the north, while Maps of Alexandria reveals the southwestern island to have both the Barbary Banner and the Jailhouse Dog, two important UT’s in this series that often cancel each other out. Knowing the Bandido would likely ram the Banshee’s Cry to dismast her, I had to try to explore the island anyway. Both flagships repair (the Roanoke at a new fort built by the AP’s in the northeast), and both Pirate 1 masters are sunk in the south. The Amity and Lezard are unable to do their usual tasks (respectively to gather gold and flip oarsmen for coins), and so they prepare for the inevitability of war. The AP’s destroyed Dead Man’s Point in the southwest, but immediately afterwards the Hai Peng showed her worth using her uber-fast speed and great crew complement to get both gold coins from the fort back home to safety. This led to an inevitable and lengthy conclusion, with the AP’s assaulting Paradis to no avail. However, in this picture you can see not only the mess, but also how close the AP’s got to destroying the fort. Paradis is down to one cannon, while the Lezard and HP only have one mast standing between them. In the end, HPFF won its second game in a row, this one by a score of 19-11! With that, HPFF seems like the better fleet, but at least one more game will be played in the series. We’ll swap the Bandido out for the Banshee’s Cry with a helmsman and explorer, and possibly switch controllers at some point. Either way, the Finals of T2 are not far away! Here is a recording of the night’s action, which happened directly after the start of CG3! The Bandido was swapped out for the Banshee’s Cry with a helmsman and explorer. I didn’t really want to do that, but I wanted to see if the AP’s could pull out a win with a more optimized setup. Here is the only picture from Game 3 of this series, showing how the Amity Hidden Cove’d to the center island and the Hai Peng used Mycron to reach the west. The Pirate Globe and Maps of Alexandria revealed the treasure distribution, with HPFF getting the better of it. They grabbed the 5 coins they needed to win (two 5’s and three 2’s), with the final score being 16-14. With that, HPFF had a commanding (and indeed, decisive in normal circumstances) lead in the series, but I wanted to experiment. We switched fleets with myself in control of the AP’s and Xerecs getting HPFF. Once again the AP’s went first since they were behind in the series. The Roanoke was Coved out to the center island, where for the second game in a row, Pirate Globe and Maps of Alexandria were revealed at the same time! With two 5’s on the southeastern island, the AP’s got a better treasure distribution. The Hai Peng couldn’t reach a far island on her first turn, and so settled for the northern one. The Roanoke blasted her with a double action but couldn’t sink her, which let her get away to the east. However, she was slowed, and by this point the Amity, BC, and Roanoke carried enough gold to win the game for the AP’s. In a rarity, HPFF got both the Dog and the Banner, raising their potential score. However, I knew how much gold was on the Roanoke, and the calculations for this series were far easier than in the other semifinal series (which had a TON of gold bonus variables). The partially repaired HP nearly managed a miracle against the Roanoke, hitting 3/4 and getting her ram roll, but lost the boarding party. The Roanoke docked home her 6 gold, giving the AP’s their first victory of the series by a narrow 18-17 margin! Those two games were quick, but the third and final one of the night was FAR longer. It was one of the most desperate and drawn-out games I’ve ever been involved in. Once again the Roanoke finds the revealing UT’s on the middle island after Coving. On HPFF’s first turn they get the Dog to knock out the Banner. The HP has built Paradis in the southwest, while the Amity and BC clean up the center and northern islands for the AP’s. The Roanoke reaches the HP with a double action but only hits once in three tries! The HP goes all the way around the map (but still very quickly of course) to reach home without being intercepted by any AP ships. She docks home her gold, which leaves only a couple coins left in play. Between the 30 gold in play and the UT’s that reveal everything, I knew how much gold was on my HI and how much was left. I came to the unfortunate realization that I (as the AP’s now) would be playing for a tie in an attempt to continue the series with a rematch. That is, until xerecs made the good point that if I could eliminate Bratley on the Patagonia, the Ransom payout could potentially give the AP’s a 16-15 win. However, that trade route (not road haha!) was fraught with waterfalls (instead of pitfalls), since a ton of things had to break right for that conclusion to even be plausible. With the game in her hands (or so we thought…), the Roanoke begins bombarding Paradis with a 2 in her hold and a 5 in Paradis. I had 8 gold at this point, so I needed both coins to tie. I was afraid that HPFF would simply trigger the Ransom keyword of Perry, making it even more of an uphill (stormy?) battle. I did have absolutely incredible good luck in this game, which is somewhat rare for me (although it’s mostly just shoot actions that give me problems). The roll for Paradis was a 1, which let the Roanoke hit 4/5 to take the fort down to just one cannon. In this picture, the HP has arrived to damage the Roanoke, with the fort contributing as well. The Amity and Lezard flock to the scene, while the AP’s BC rams the Patagonia, killing Mycron. A fair bit of wackiness later, and the Roanoke is derelict and the fort is abandoned. The HP, Patagonia, HPFF BC, and Lezard are all dismasted. This was where things really degenerated into madness, but unbeknownst to us, it was just beginning…. So much happened in the “endgame” (I call it that since we were fighting over the last few coins left, but it took longer than the other parts of the game) that I cannot remember all of it. HPFF managed to capture the Roanoke and began repairing her at the fort, but the Amity put a stop to that and eventually the Roanoke sank. The Amity became a major factor in the game, providing All-Star service to the AP’s. However, the pesky rams from the HP and Lezard took her down to 1 mast. In the southeast, the “Battle of the Banshees” took place, with the HPFF Banshee’s Cry eventually prevailing, but not before the AP BC successfully boarded the Patagonia again to eliminate Bratley and give the AP’s 1 extra gold! However, now that the AP’s were down to just one ship, the Amity, they couldn’t afford to lose her. With HPFF having a gold advantage, the Amity needed to keep her final mast standing at all costs. As a result, although her priority was to get the 5 coin from Paradis (abandoned but still standing), she was forced to ram and dismast any potential threats in the area. This included the Lezard and Hai Peng, both of which had oarsmen before the Amity eventually eliminated them to render them harmless. Whew! This is just about as desperate as this game gets! But of course! More ramming and boarding! LOL. The Amity needed to take care of the dual BC threat (both healthy and in the HPFF fleet) before moving back to the fort (I believe she had missed a handful of times with her remaining 5S gun in the attempt to destroy it). Both BC’s were dismasted, but another shenanigan was continued from earlier, though I haven’t mentioned it yet: the Roanoke’s old 2 coin was making its rounds through both fleets, and it was probably on at least 4 of the ships by the time the game ended. The Amity was trying to protect the 2 coin and recover it and re-recover it so that HPFF couldn’t get it home somehow. This all in addition to the whole purpose of getting the 5 from Paradis! After much trading of gold and crew, and the building of a fort, my calculations revealed that I could not win with HPFF in this game. This was due to how early everything was flipped due to Maps of Alexandria – even with gold bonuses piling up for UPS 2, I was able to figure out the situation in terms of gold scores, both real and potential. The best I could hope for was to lose 22-21, since UPS 2 had the Barbary Banner and Jailhouse Dog (which had been played to deny my Hai Peng from getting Holy Water), in addition to a trio of +2 bonuses. The semi-worst case scenario in a long endgame would see HPFF lose 23-20 instead. Therefore, we called it, with UPS 2 technically winning the first game 22-5. With only Paradis’ 5 left in play, we counted gold to see if it was relevant. With UPS 2 winning 14-11 NOT counting the fort’s gold, it was clear we had to play the endgame out. Things quickly devolved into a ramming fest, with the Banshee’s Cry playing the role of hero. She was able to sail out, ram off a mast from a UPS 2 ship, get rammed in return, row home at S+S with the help of Mycron, and then repair and sail out to ram again on the next turn (with the help of Mycron). UPS 2 needed to destroy the fort to eliminate or claim the gold there, but they couldn’t get there. The ramming and boarding antics favored HPFF, who got consistently better rolls. The Coeur was captured and the HP dismasted, at which point we called it. HPFF wins the second game 16-14. With that, UPS 2 has a 2-1 lead over HPFF! At least one more game will be played, and we’d like to see UPS 2 win while going second to have a more decisive and conclusive result. Either way, the greatest fleet ever will be crowned very soon! HPFF went first with its back against the wall. The HP reached the center and northern islands on the first turn, with one of the UT’s revealing where everything was. I don’t have more pictures from this game, since it ended in a tie! 19-19 was the final score, which meant we had to play on. With the fort’s gold becoming irrelevant, UPS 2 had a 19-9 victory! This time HPFF did build a fort on the western island, with Dead Man’s Point providing a second fort. Both Hai Pengs were busy trading gold home, but the advantage of UPS 2 lies in its gold bonuses…. It’s finally over! After starting this tournament in October 2016, it fittingly ends right as 2017 ends as well. The tournament featured 16 different fleets, and it took 53 total games to have a decisive winner. If you watch the video you’ll get the gist of it, but here’s how we started things. Xerecs rolled higher than me to go first in the player turn order. From there, we decided to do a draft in reverse turn order! This meant that I had the first pick in the draft, followed by Xerecs for a fleet, and so on until all the fleets were picked. This was a fun way of doing it rather than haggling over which fleets we each controlled. We ended up with mostly the fleets we wanted to play, which is great. I had some conflicts of interest and decided to choose fleets that were NOT my own, passing over HPFF to select UPS 2 (a fleet I like about as much as HPFF though) and taking the swarm fleet instead of RtSS English since I’ve barely controlled the swarm fleet at all since T1 began. However, I did go with classic favorites American Pirates and HMS GT, while Xerecs went with some of the more combat-heavy options, locking up both Spanish 5 masters along with the Doldrums and Kettering. Since this game is purely for fun and the tournament is over, it would not nearly be worth the considerable time involved to recreate all 16 fleets in a bigger ocean to have a “standard” setup with 2 wild islands per fleet. Also, less wild islands and less distance between islands can often make for a more fun, fast-paced, and combative game. We were barely able to fit 32 total islands in, with 16 home and 16 wild. This meant there would be 8 coins per island, double the normal amount. 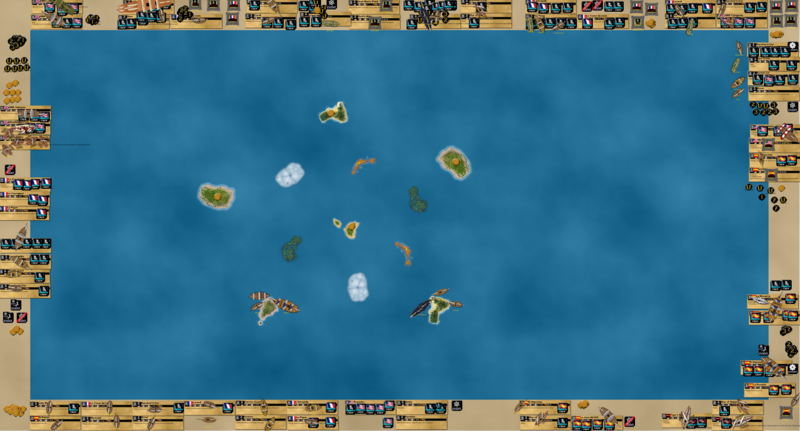 The home islands were chosen in draft order/reverse turn order, with UPS 2 picking their HI first. The Swarm fleet is heading towards at least 3 wild islands, and may somehow be the first to explore 2 of them. However, they have been denied of that island in the center/northwest by a wacky first turn from UPS 2, the last fleet to go each round and the winners of the actual tournament. UPS 2 continues to dominate headlines, winning the tournament in grand fashion, getting picked first (albeit predictably) in the draft, and now finishing the first round of turns with a BANG. The HP was coved out to that island where you see a bunch of Pirate crew chips. The HP redocked to explore but also shoot at the nearby HMS London of the HMS GT fleet, incredibly shooting 2/2 to take the London down to 2 masts! I was originally going to trade home the best coin and then drop some crew to sac and get home with more (so the London couldn’t return fire next turn), but one of my least favorite UT’s in the game ruined all that: Natives. Ironically one of the UT’s placed by the HMS GT fleet, this freezes the Hai Peng for FIVE turns, since that’s how many crew were on the ship when the island was explored. O_O In all likelihood this could doom UPS 2’s chances of winning, but they could at least finish the explore action even if they couldn’t sac afterwards. The island was good otherwise, with CJS trading home a 7. Paradis was built! This may keep the London at bay while simultaneously keeping the swarm fleet from taking any of the island’s remaining gold. The Hai Peng was simply emptied out, since the crew and gold will be safer inside the fort. Also, I didn’t want crew on the HP since if she is somehow still alive after 5 turns of sitting there, she could redock and take the remaining gold without triggering the Natives again. I wanted to send the Coeur out to the island, but figured she’d be safer at home with the London still lurking. 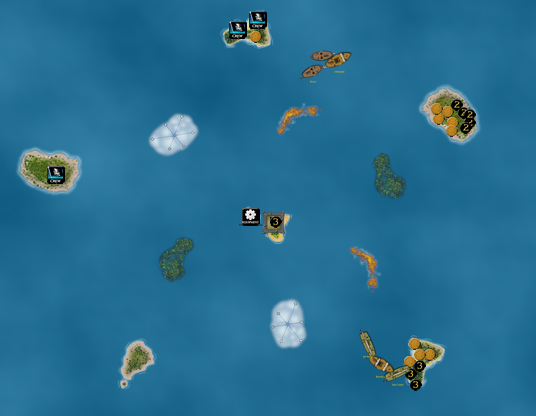 Overall a wild turn for UPS 2, from the brink of glory (flipping a 7, building Paradis, and saccing to get most of the island’s gold back home) to disaster (Natives keeping the rest of the gold there and likely dooming the Hai Peng for the rest of the game). Whew! What a first turn! The sheer amount of fleets and things to do each turn mean this game will take quite a while to complete over the course of several VASSAL sessions. We hope to continue the video footage, and we’re looking forward to what will likely become one of the best games we’ve ever been involved in!! In the deep south, the Minuteman flotilla missed all of her shots on the Roanoke and Neptuno. The Artillery Strike fleet did not reengage with the American Pirates or RtSS English, instead opting to regroup in preparation for a potential round-earth assault from the HMS Grand Temple. However, after considering all the options (with an EA available from Calico Cat), the GT decided to stay close to home and go after the lucrative island where UPS 2 was stuck at (HP sitting around for 5 turns due to the Natives there). HMS London got things started, dismasting the HP and Lezard while staying out of range of Paradis. However, after the GT used a whirlpool and extra action to get in range of the fort, the roll came up a 6! One miss meant that the mighty GT couldn’t even damage the fort, and that’s exactly what happened. It may look silly now, but this was the best route Lord Thomas Gunn saw after considering the various options. 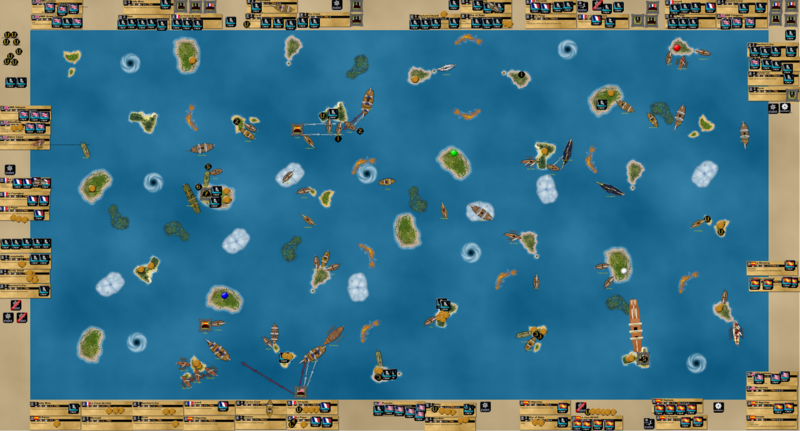 Attacking the canoes and Artillery Strike in the deep south may not have led to any gold, and it’s quite possible that the cannons of that Spanish fleet would cripple the GT next turn. Whirlpooling to the center would mean the GT would be stuck in a crossfire between Armada and the San Cristobal, with towing home multiple swarm ships for gold not a likely possibility. With the Joya del Sol in a fog bank, there were almost no gold targets within reach of the GT from that whirlpool at the center right. In the southeast, attacking UPS 5 likely would have been a disaster (Zeus + Paradis at the same island O_O). Overall the HMS GT fleet made the choice they saw as the most profitable in the long term, as they will still try to win the game despite being more of a 1v1 deathmatch fleet. If they can indeed destroy Paradis and UPS 2 in the process, that wild island has at least a 7 along with all the gold the HP has seen but not loaded. With only some of these fleets taking turns during this live session, here’s the busy situation around the swarm HI. Paradis has shot two masts off HMS Grand Temple, while the swarm fleet gets gold home from the south but struggles against Spaniards in the north. In the south, the AP’s got some gold home to build Thompson’s Island, with the Roanoke damaging the Minuteman flotilla (of the Kettering fleet) and Neptuno. The captured Kettering was docked at the northern end of the island when the Roanoke docked in an effort to protect the Bandido, who was also coming home like the Amity. Alas, it was of no use, as the Artillery Strike fleet has a fantastic turn! The Roanoke was sunk by the power of both flotillas and the Neptuno, with the Diablo going 4/4. The Neptuno then turned her cannons to the other ships in the AP fleet, sinking the Kettering and dismasting the Bandido! Once looking strong to finish high in the standings in yet another big multiplayer game, the AP’s are now teetering on the edge of disaster. 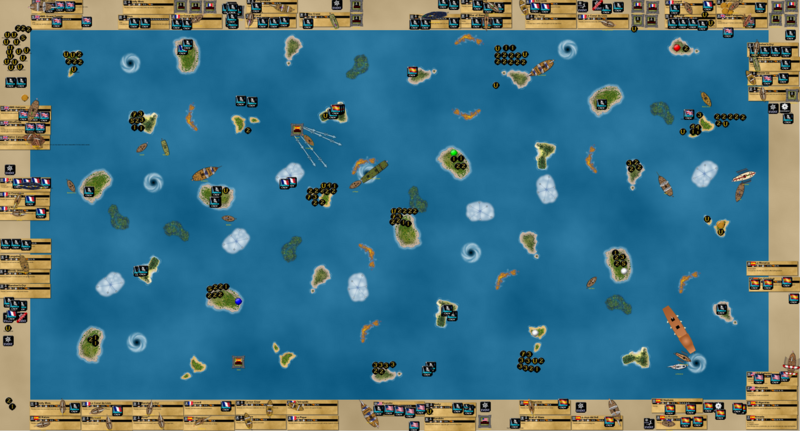 At the left, the Artillery Strike fleet accomplishes a rarity, with 2 gold both from eliminating Ransom crew in the same game (in this case two versions of Commodore Matthew Perry from the Roanoke and Kettering). I’ll go west to east to make things easier to look at. HPFF has built Paradis de la Mer in the far west, just to the left of where HMS GT has taken out all flags on the Paradis of UPS 2. 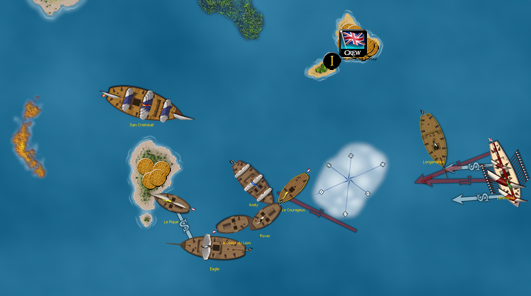 With the London capturing the Hai Peng of UPS 2, the remaining ships in that fleet have fled north in search of alternate treasure options. In the upper center, about half of the swarm fleet has gotten into a crossfire mess between part of the Kettering fleet and the San Cristobal of the Spanish Meta fleet. 4 ships are derelict, but the swarm fleet still has 5 ships with masts up. EA gold runners is having a fantastic time of it, with the Joya consistently getting her EA’s most turns. She has dropped off a full spicy load at the HI, and has sailed back out to nab some gold from under the Coral of UPS 4 in the south. 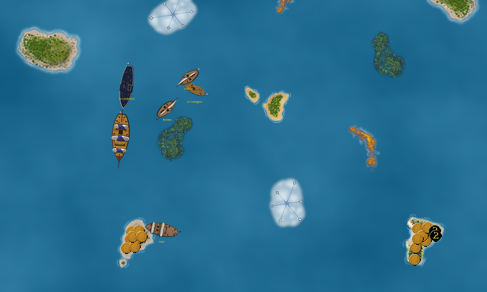 The Rover of the Gold Race fleet has dismasted the Star of Siam, but the SoS is limping home on oar power with a coin left. 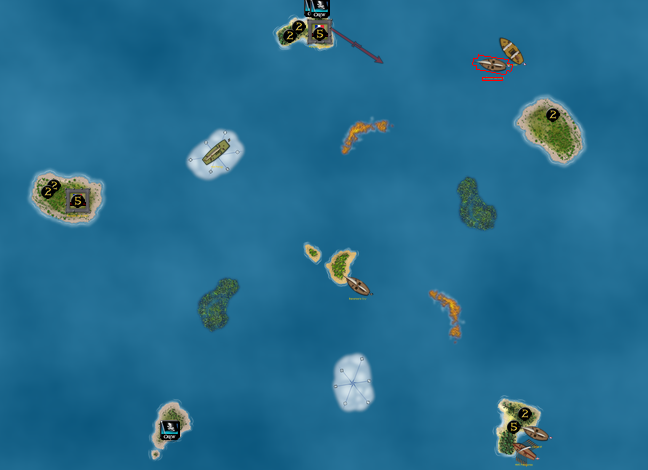 Speaking of the Gold Race, their Banshee’s Cry was sunk by the Elthelfleda of RtSS English, who you can see at the lower right in the vicinity of the Zeus. In the northeast, the Neptune’s Hoard ran into a cancelling problem, but was lucky to lose only two masts to the Vengeance of the Quick fleet. The Vengeance will try to tow the Pique home while the Courageux looks for gold in the west after round earthing (probably). 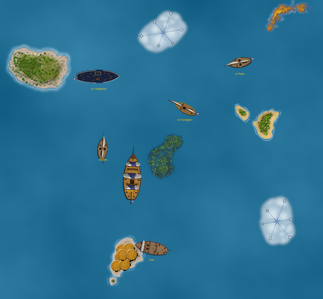 The Doldrums fleet has amassed quite a stash, and I think they still have Becalmed left to use. Later in the action, with a few more developments. In the far northwest, the Algeciras of EA gold runners looks to intercept the English canoes. In the far southwest, her fleetmate the Joya del Sol looks to grab gold from the island the canoes loaded up at! The swarm Algeciras has joined the fight against the Armada flotilla terrorizing the middle northern part of the map, but the San Cristobal has left that same area to round earth to the south and dismast both ships remaining in the UPS 4 fleet. UPS 4 had a great start and have enough gold on their HI to maintain a respectable finish in the standings, but as of now it looks like they might be the first fleet eliminated. Speaking of riches, the swarm fleet is piling up some gold. 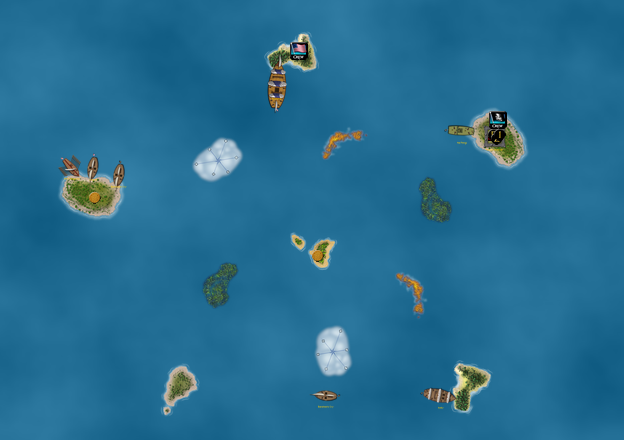 They only gained control of 1 of the 3 wild islands they were targeting from the start of the game, but they have made a good profit nonetheless, wiping the island clean with 3 different ships. The American Pirates managed to get the Bandido home, but Artillery Strike still lurks in the deep southwest where their fort is located. 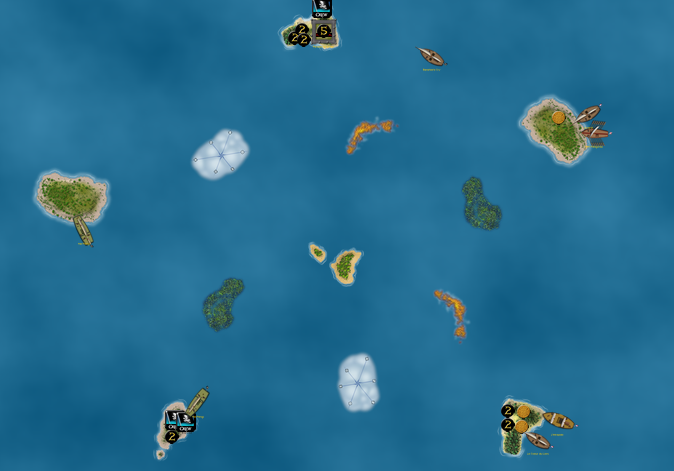 The bonus ships of the Gold Race fleet (Sea Crane and Bonnie Liz) have begun heading north, fearing the San Cristobal’s arrival in the south. The faster pace of play has been nice as we approach one month since we started this game. With so many fleets, there is a massive, unprecedented level of uncertainty. It’s not QUITE anyone’s game, but at least half a dozen fleets are easily in the running for the win and possibly 10 or more still have a shot. O_O It’s a fun free-for-all that will likely see extremely close gold scores similar to the 8 fleet game, and we are looking forward to the eventual conclusion! 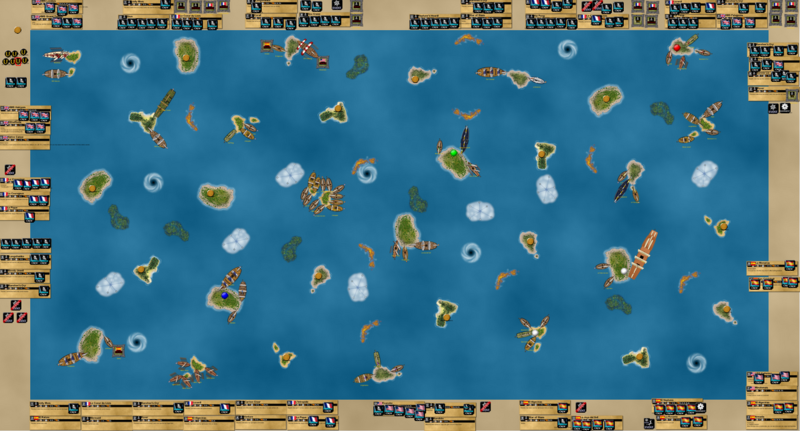 Most fleets have quick turns at this stage of the game, so we were able to cycle through a lot of minor developments. 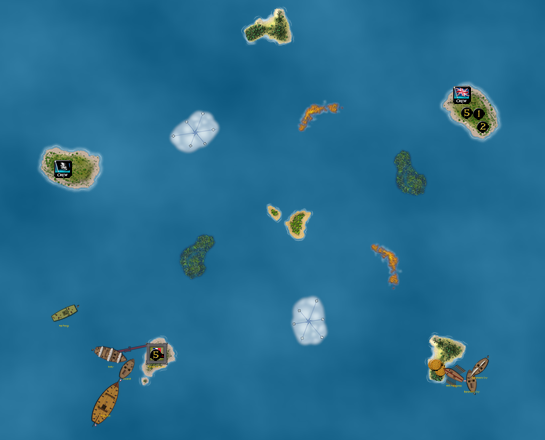 At the far left, the Halcyon and Elthelfleda of RtSS English are heading home, while the Courageux of the Quick fleet has round earthed in search of treasure, which has so far eluded Maurice Aristide. One of the more exciting developments of the night was when the Hai Peng of HPFF rolled a 6 to activate Maps of Hades , which not only denied that fleet from using Mycron on the HP, but also the player “to their right” would be the American Pirates!! This was an ultimate irony, as HPFF and American Pirates have one of the longest fleet-to-fleet rivalries of all time, first matching up in a classic 3-game series back in January 2015 before having an epic rematch in the semifinals of T2. It’s safe to say that the AP’s hate HPFF, and the Hai Peng in general by extension. 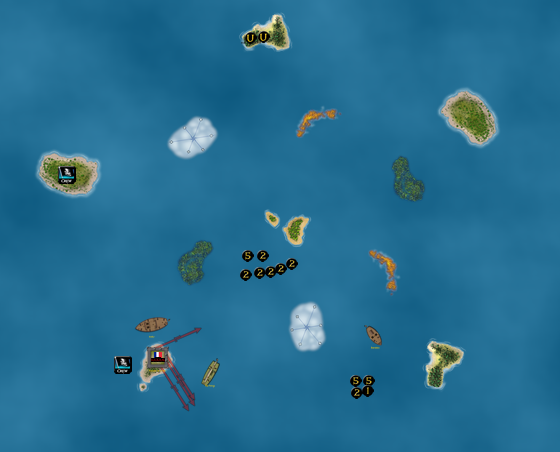 In a “double whammy” move, they sent the HP south to shoot at the Hai Peng of UPS 2, which has been captured by the HMS GT fleet! Both shots missed, but the HP of HPFF got stuck in the sargasso sea! 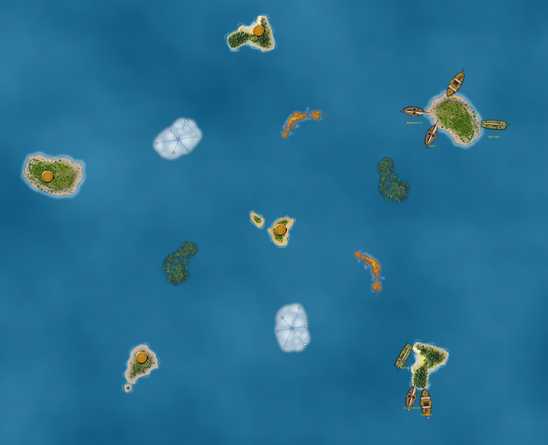 Speaking of the GT fleet, they have destroyed Paradis on that wild island, which is now “open for business” again. XD However everyone now knows of the Natives there that doomed the UPS 2 fleet, which basically requires the GT fleet to drop off crew (for the London at least) in order to explore the island and take coins. 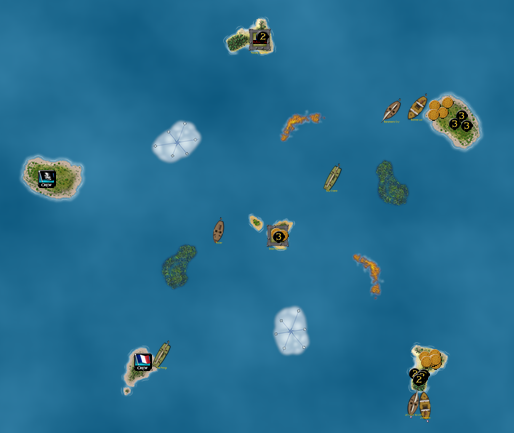 With most other wild islands wiped clean, that island and other fort islands (such as the Paradis of HPFF just to the west) may become hotspots of activity with most of the gold concentrated there. 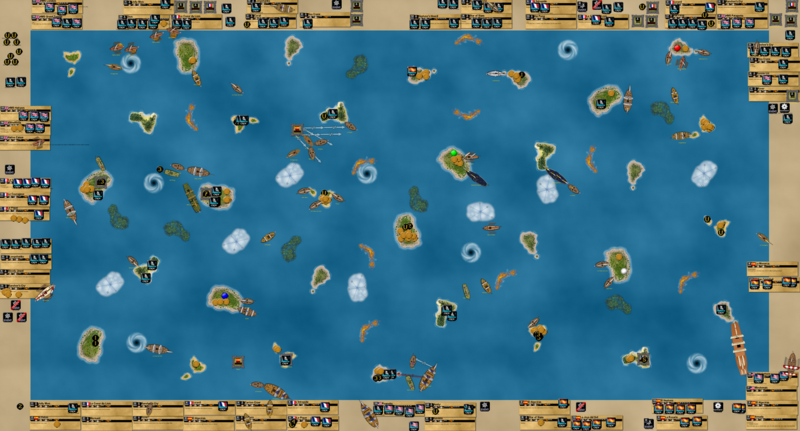 To the right, the swarm fleet has had at least two ships sunk and one dismasted by the Armada flotilla, which is the only functioning game piece left in the Kettering fleet. Further to the right we have some brutal gunship vs. gold runner engagements. The Zeus hit 2/6 to damage the Joya del Sol after whirling to that region with Grease Barrels, while the San Cristobal continued her reign of terror in the south, dismasting both 2 masters of the Gold Race fleet. A short bit later and HMS GT has sunk the HP of HPFF (! ), along with the Algeciras of the EA Gold Runners (the latter of which took out an English canoe earlier in the night). The AP’s are back in business to some extent, with the Bandido repaired and most of the big threats of the area (Kettering, Neptuno, etc) finally gone. South of the GT, the swarm Intrepide and Quick Courageux are looking for gold, but most of it is defended by gunships or forts. In the northwest, UPS 2 had a hope at that previously unexplored wild island, but the Neptuno may put an end to their dream of a comeback. In the center, the Joya and others have been frozen by Becalmed, which was finally played by the Doldrums fleet! The Zeus predictably won a firefight against the Joya, which is now derelict. However, the Star of Siam used an EA to row home with a coin. The EA runners have had incredible luck this game, but now they have no masts standing. The San Cristobal has left the south a desolate wasteland, with 4 derelicts trying to scuttle themselves (UPS 4 and Gold Race essentially out of it). 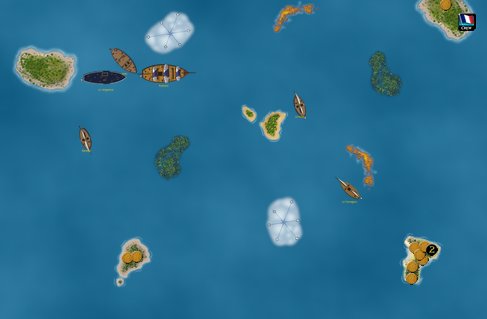 The Norvegians and Spanish Meta are still doing well health-wise, but the Doldrums fleet is really piling up the gold. The Monarca of the Spanish Meta fleet was dismasted but then rescued by the San Cristobal, who put an end to the Norvegia fleet, making them the first fleet technically eliminated. UPS 4 quickly followed them with scuttles, and by the end of the night UPS 2 was also out of it! Of the 13 fleets remaining, a handful have quite a bit of gold. 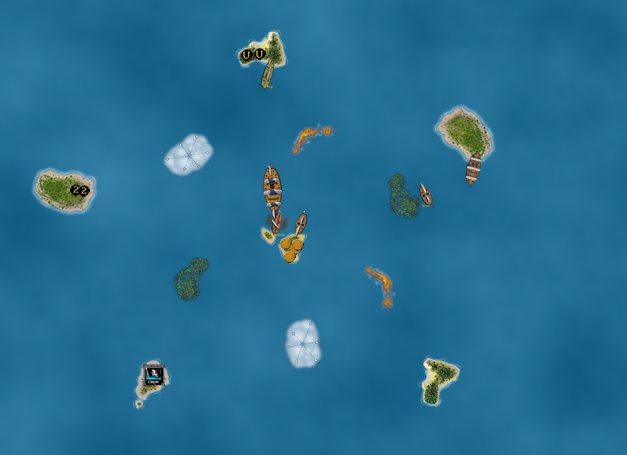 In the center, the Joya del Sol was sunk but her crew escaped with gold via a Raft to the wild island the swarm fleet was smashed at. However, it wasn’t all bad for the swarm fleet, for they had a Pique Miracle! (patent pending XD) The Pique still had her helmsman and oarsman, and finally started rowing after the effect of the Natives wore off and I remembered the generic crew aboard. After this picture she got home with 6 additional gold for the already-wealthy swarm fleet, with 4 coming from Buried Treasure. After a bizarre situation where they had 4 ships and no gold (strange since they started with 2 ships and most fleets have gold but less ships than they started with XD), the HMS GT fleet is rising up! The repaired Lezard is loading gold from the wild island where UPS 2’s Paradis fort was destroyed, with the London and Hai Peng (captured from UPS 2) possibly looking to join her. 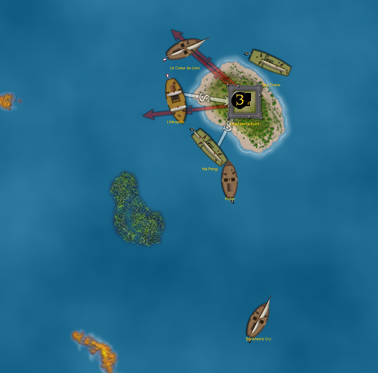 However, HMS Grand Temple has been quite busy, destroying not one Paradis de la Mer, but TWO in a single game! After towing home the HP and repairing, she got an EA to finish off the Paradis southwest of their HI. Of course, she got solid help from the London and enemy Halcyon (basically another London haha) along with a lucky 1 roll on the second Paradis’ fort ability (though she rolled a 6 on her first attempt at the UPS 2 Paradis). However, with the arrival of the mighty Zeus from UPS 5, things may quickly unravel for the HMS GT fleet. That’s right, it’s a showdown between the Zeus and the Grand Temple! However, the Zeus sacced out of the whirlpool to hit an impressive 5/7, likely dooming the GT in the near future. That said, with both of those Paradis’ gone almost at the same time, it opens up a bunch of newly available gold in the northwest, which is why I zoomed in here to see all the action. 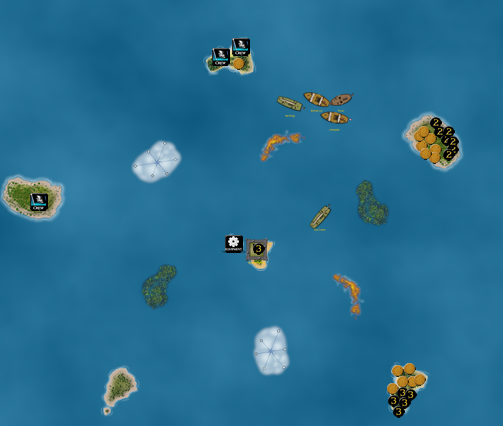 In the far north, the swarm fleet’s Intrepide is trying to take gold from the island where the remaining two UPS 2 ships have been dismasted by the Neptuno of Artillery Strike. At the bottom right, the Pique Miracle is complete as the ship docks home and then repairs. However, trouble for the swarm fleet is brewing. 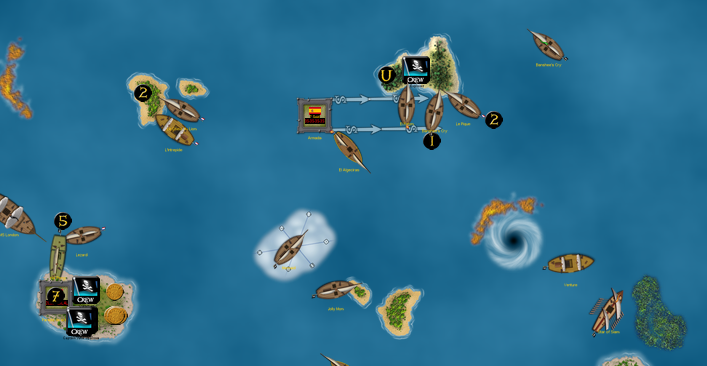 The Coeur has loaded the coins from the Joya’s Raft adventure, but the Star of Siam (the Joya’s fleetmate in EA Gold Runners) has whirled to the area in an attempt to steal it back! 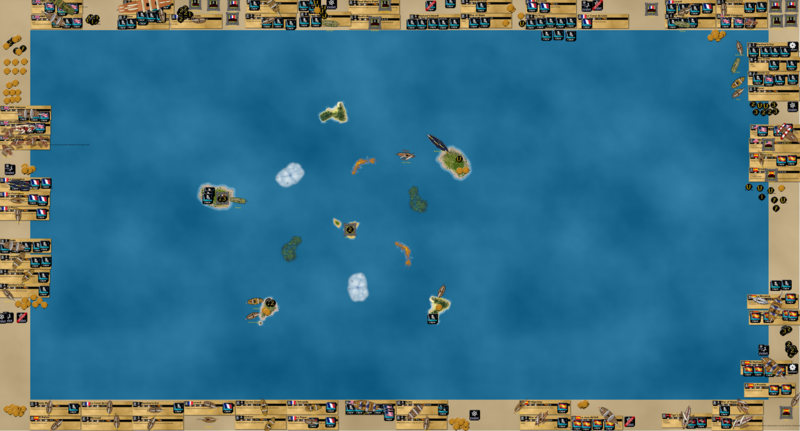 Complicating matters is the Bandido of the American Pirate fleet, which is doing alright but won’t get enough gold to win. There was a mistake where the Neptuno had a false reroll, which may have messed up some of the stuff earlier in the game. However, the fleets affected (Artillery Strike, AP’s, USS Kettering, and now UPS 2) were not really in the running anyway so it is not likely to affect the top standings results at all (hopefully; maybe someday I’ll go back and look at the videos to find out haha). At the far right, it’s another Pique Miracle!! (TM) After being dismasted early in the game by Norvegia, the Pique of the Quick fleet sat at a wild island for a while (somehow not being sunk or captured by Norvegia, Spanish Meta, Doldrums, or anyone else) until the Vengeance finally showed up to tow her home. The return trip was uninterrupted, and another Pique has somehow made it home with gold! Speaking of the Quick fleet, their Courageux had a mast rammed off by the Intrepide of the swarm fleet and can be seen lurking in the far west after retreating into and back out of the fog. In the south, the Diablo flotilla has destroyed Thompson’s Island, but the Amity will just get the gold home for the AP’s anyway. The Bandido ended up ramming the Jolly Mon of the swarm fleet, netting the AP’s an extra gold from the Ransom keyword. With three fleets (Norvegia, UPS 4, and UPS 2) out of the active running and with much of the ocean deserted, the game is winding down. There is still considerable treasure to be hauled home, but it requires extreme bravery due to the forts protecting it and the various monster gunships (Zeus, San Cristobal, and until this turn the Grand Temple) still sailing around. We should be able to finish the game with another session or two, and then we’ll have an epic coin count to determine the winner and finale of this T2 story! Another session was played. The entire game is just desperate and kind of wacky at this point, so it’s tough to remember all of the insignificant details. In the far west, the Zeus has shown up to crash the HMS GT fleet party. The wounded GT and HP have tried to block her, allowing the London and captured Lezard to get coins from the island where UPS 2 essentially met their doom in two ways (Natives plus Paradis destruction by the GT). In the center, the swarm denies the Star of Siam and is about to capture the Bandido. The Doldrums continues to rack up the gold, while the Quick fleet tries to round earth to the far west. In the NW, the London got home by whirling a slight bit to the far north so the Zeus wouldn’t be able to get her. She brought home some nice gold for HMS GT, who has risen to late-game prominence a bit after a somewhat slow start. The SoS has stolen the Intrepide’s final coin, but the Lezard has rammed a mast off. The Pique captured the GT. In the SW, the Amity used Skrew Engine to ram the final mast off the Neptuno, getting ready to capture the ship for some revenge at the Artillery Strike fleet being very detrimental to the AP’s early in the game. In the SE the San Cristobal and Monarca have loaded up a lot of coins from the spoils of UPS 5’s Paradis fort, now destroyed by the Spanish Meta fleet. The Quick fleet had a good turn, with the Courageux capturing the Longshanks and the Pique darting into the fog to protect her gold. The London picks up her captain and helmsman, sailing out to wreak havoc. The English are tired of running gold! The London goes 3/3 against various canoes as the Star of Siam improbably escapes home via the whirlpool with her coin. The Bandido and Jolly Mon of the swarm fleet (Bandido captured) face off against the Lezard of HMS GT (captured from the swarm fleet!) for the final coin of the western Natives island. So many ships have swapped sides in this game that is has gotten rather confusing. Another example of that is in the northeast, where the AP’s try to make things interesting. 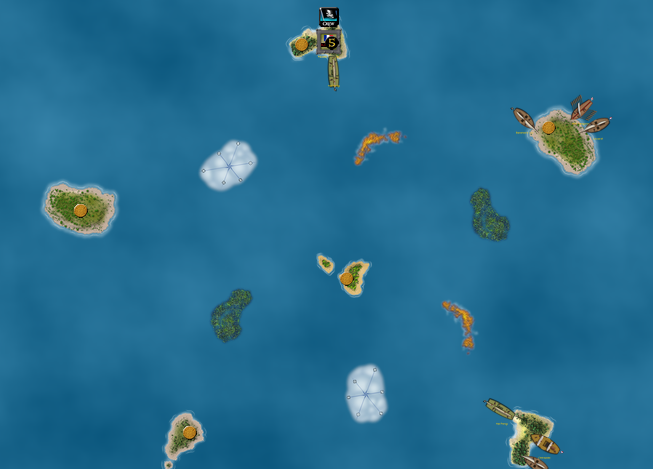 The Amity would take a while to drag the captured Neptuno back home and repair her, so the AP’s are giving the Neptuno to Spanish Meta (ironically an all-Spanish fleet) in the hopes of creating a short-term alliance to help bring down the Doldrums, who I suspect have the most gold. The Doldrums fleet even has a shot at the Courageux, who has both coins still aboard and is likely the largest amount of gold left in play that is realistically available (Zeus with 7 masts left is just about unbeatable at this point haha). Speaking of the Courageux, she has been captured by the Rover of the Gold Race fleet! In a reversal from the previous handful of turns, the west empties out as eyes turn towards the Doldrums vs. Quick showdown of sorts in the far east. Neither of those fleets may win the fight however, as the Eagle sinks the Vengeance and the Rover takes the captured Courageux into the fog. Various single ships are on their way to the area, including the Amity, Coeur (of the swarm fleet), and Elthelfleda. 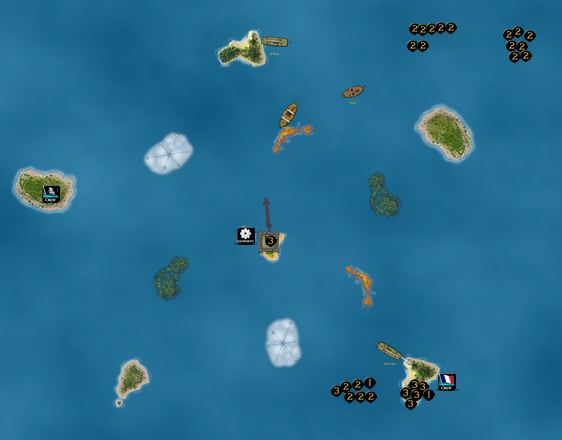 The AP’s plan backfired, as the Spanish Meta fleet rammed the Amity. The Zeus got her gold home and the London looks to explore to take the last coin from the former UPS 5 island. At the upper left, the Lezard (now of HMS GT) whirlpools to the northwest to avoid the Jolly Mon of the swarm fleet. HMS London of the same fleet has one of the other final coins, so the Monarca and Star of Siam have entered the area, anticipating the return of the London through a whirlpool. In the far east, the Eagle has gotten one of the Courageux’s coins and ducks into a fog bank near her HI for safety. Yet AGAIN there is chaos in the far northwest! The London returns, but is ambushed by one of her own former allies in a way! The Zeus of UPS 5 loaded aboard the HMS GT’s Calico Cat, and her extra action allowed the Zeus to go through the whirlpool to steal the London’s coin! However, it made the Zeus a magnet for fire, and being pinned to the London meant it would be difficult for the Zeus to get the coin home, even with 7 (at the time of the ram) masts remaining. The Neptuno, London, and Star of Siam all pounded away at the 10 master, with the Jolly Mon and Lezard anxiously waiting to ram and try to steal the coin. The Lezard of HMS GT DID steal the coin away from the Zeus, but the Zeus sank the London to unpin herself shortly afterwards. Then she smashed the Lezard and took the coin back, sinking the Jolly Mon and eliminating the swarm fleet in the process. XD The San Cristobal won the final battle in the far east, taking the Courageux’s other coin all the way home (the Eagle of the Doldrums fleet did unload the other one). With that there was only one coin left!! The San Cristobal got an extra action to go through the SE whirlpool and dismast the Zeus, stealing the coin!! The Zeus would indeed NOT get the coin home, as it instead went to the Spanish Meta fleet, who had an incredible and dominant endgame. In an epic COIN COUNT, Dakmor’s Swarm Fleet has WON the 16 fleet game!!!!!!! Truly incredible with a 1-gold margin of victory for the swarm fleet! For the past few sessions I suspected that the Doldrums fleet had the most gold, but the swarm did very well. They had the Barbary Banner, which I think was included in a “motherlode” of about 14 gold brought home by the Intrepide. 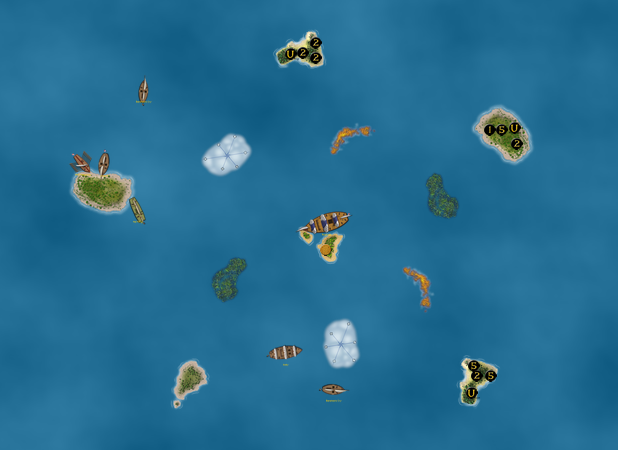 The swarm fleet ekes out a win, proving that it’s a great fleet to use in multiplayer games (which was already established from games I played a WHILE ago, but still, winning a 16 fleet game is a big deal after all! XD). The EA Gold Runners fleet did admirably, coming in 4th after winning the 12 fleet game I played awhile back. The AP’s (winner of the 8 fleet game and 2nd place in the 12 fleet game) didn’t do as well as I had hoped (I wanted them to win among my fleets), but still had a respectable finish in the top half of fleets. From there it was mostly disappointments, but only so many fleets can do extremely well with so many participants. The Zeus of UPS 5 had a powerful endgame but they finished with just 13 gold. Fleets like Norvegia, UPS 2 and HPFF underperformed, but that was partly due to going late in the turn order. In fact, the top two fleets of this game were in the first 3 fleets to go in the turn order. In that case the AP’s and Gold Race fleets outperformed their starting positions a bit, but so much happened on the early turns that getting behind meant doom. Overall it was a very fun game! This officially concludes the Tournament #2 festivities for good, and likely it says goodbye to “official” tournament play for a long time, at least between Xerecs and I. We hope you enjoyed the journey, which started in fall 2016. O_O From here we plan other adventures, including a grand one that will hopefully start sometime this year… plans to be revealed at a later date….